Michael Hagan(Yankees Historian), Michael Wagner(Yankees Historian and Author), Harry Swanson(Yankees Historian and Author), Chris Jones(Yankees Historian), and Harvey Frommer(Yankees Author). 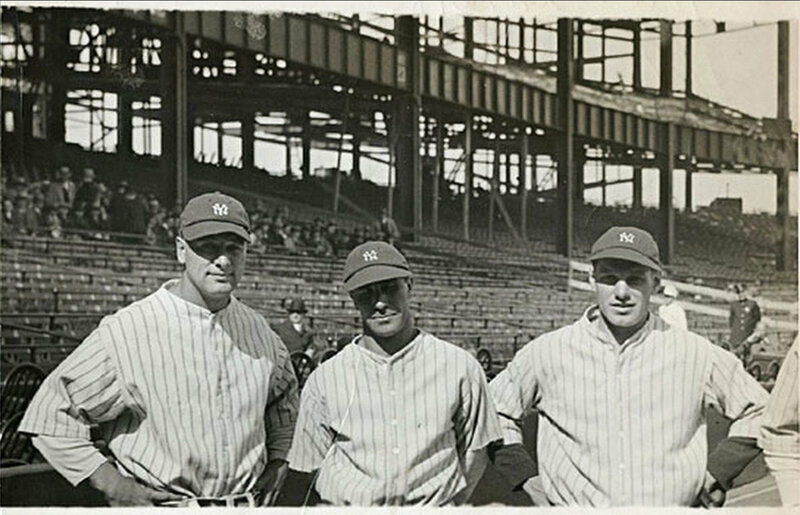 Yankees Historians who are also always a help are Paul Doherty, Tom Noonan, and Marty Appel. Thanks to all! 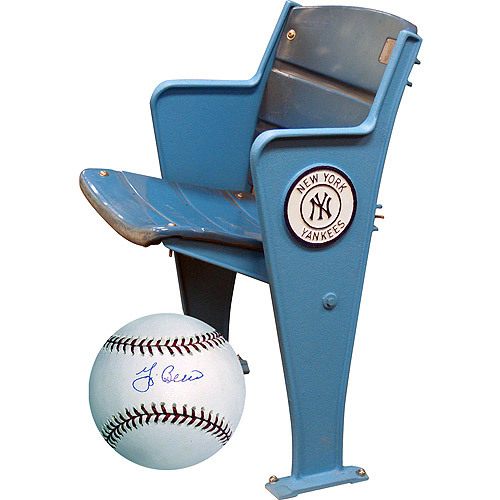 Let me start by saying that collecting seats from old stadiums and arenas has become quite popular over the last decade or so. 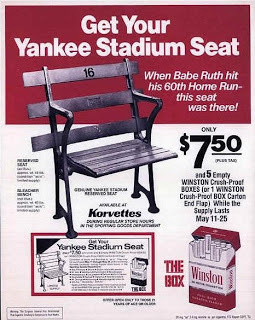 Back in the 70's and 80's, seat collecting was only done by a few. They were big, bulky, and few saw the desire to have these in their possession. 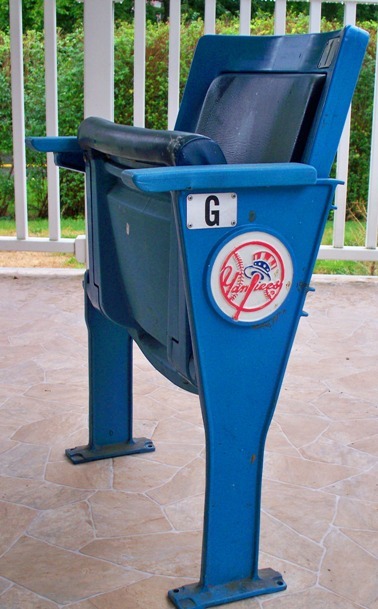 As the 90's and 00's started to roll around and the older stadiums and arenas starting being brought down, the interest in collecting stadium and arena seats began to grow. 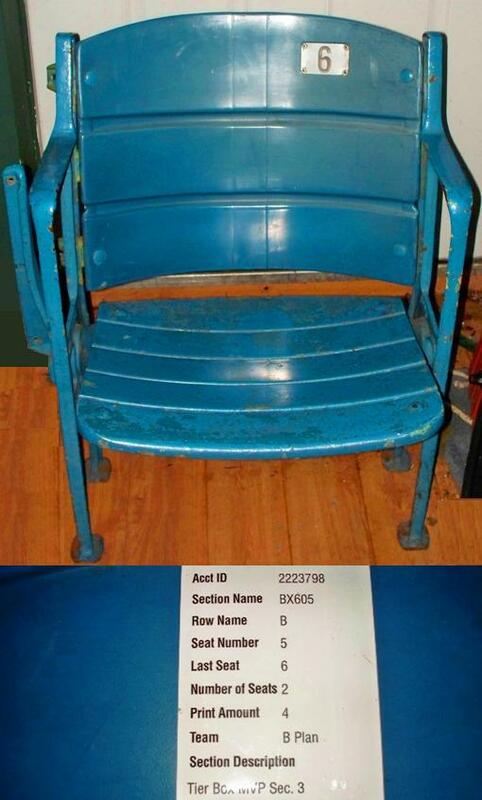 Many stadiums and arenas sold these seats for very cheap, and in fact, some even gave them away for free. 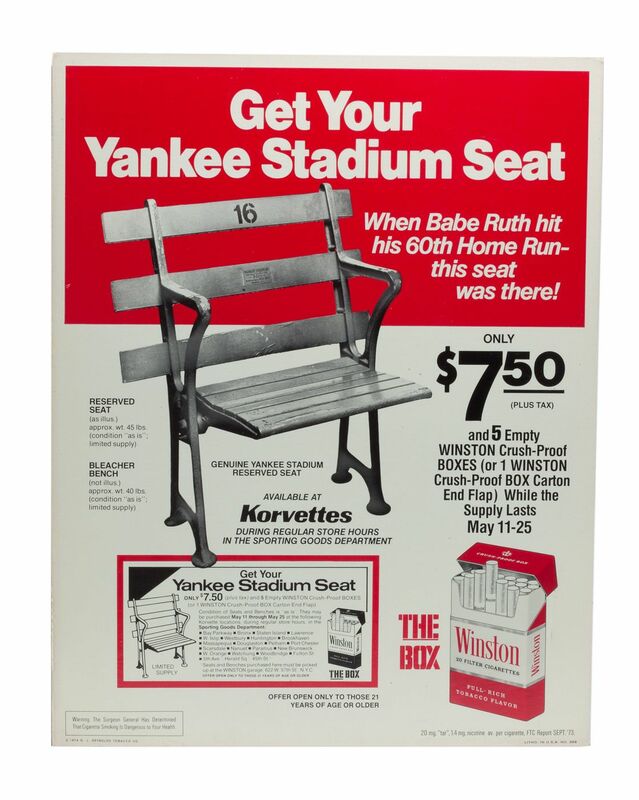 On May 12, 1974, the NY Daily News ran an ad "Get Your Yankee Stadium Seat - only $7.50 plus tax and 5 empty Winston crush-proof boxes while the supply lasts." 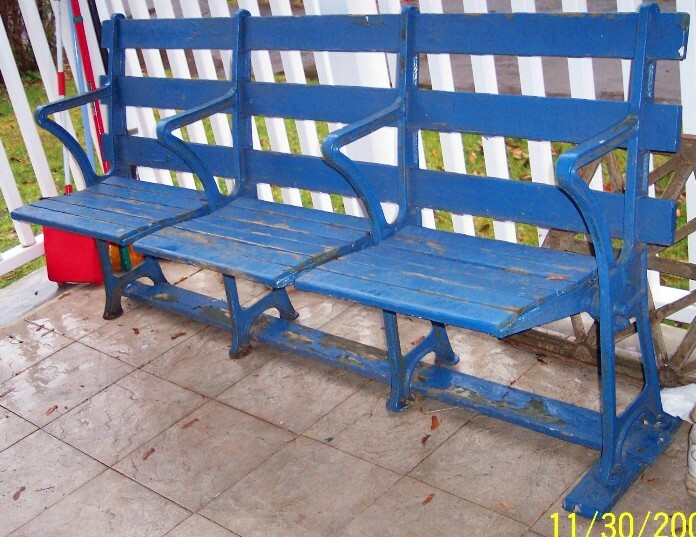 Reserved seats weighed 45 pounds and the bleacher benches for sale weighed 40 pounds each. There were 23 E.J. Korvette's stores that sold these items. Korvette's discount department store was founded in 1948 and closed in 1980. 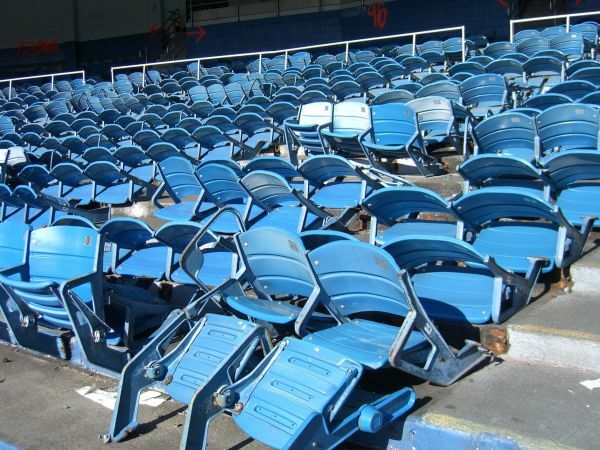 It was easier to give them away or sell them for cheap than for the deconstruction companies to have to part them out and ship them off and worry about the recycling of materials and dealing with the asbestos that some of these seats contained. Lead paint was also an issue they did not want to deal with. 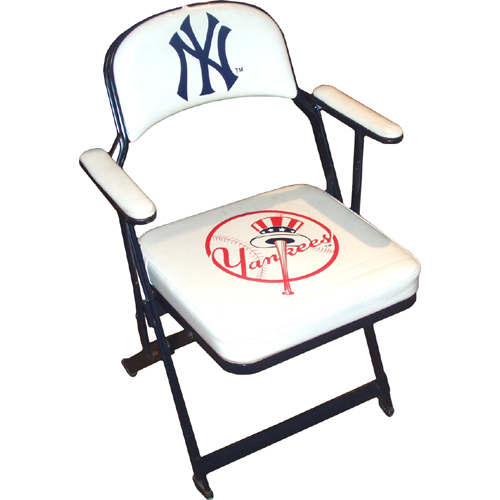 Seats from stadiums and arenas are a great way to relive memories and make a great collectible. 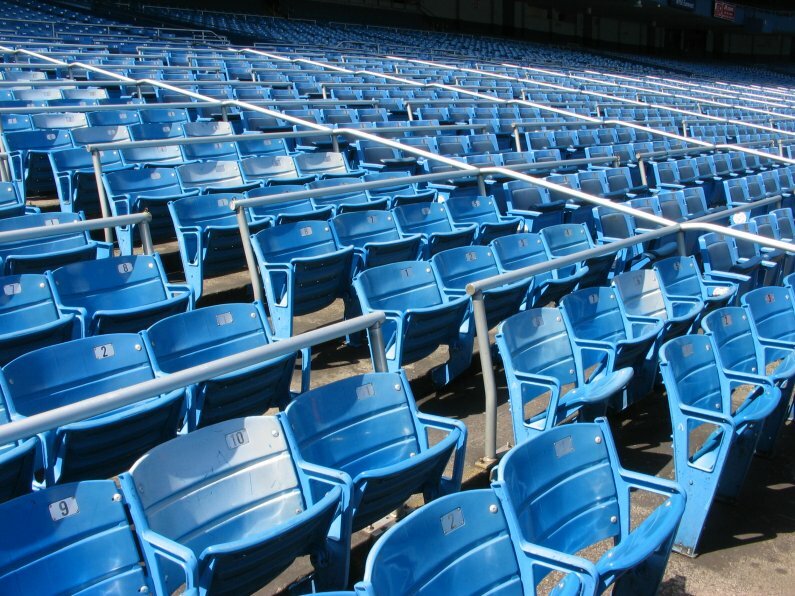 The market for seats has risen and declined over the years. 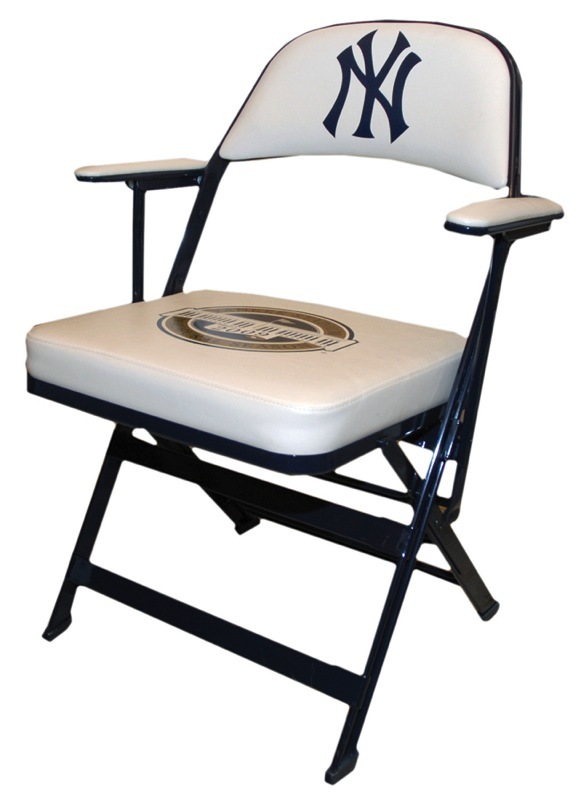 It goes without saying that some of the most popular seats around come from Old Yankee Stadium. 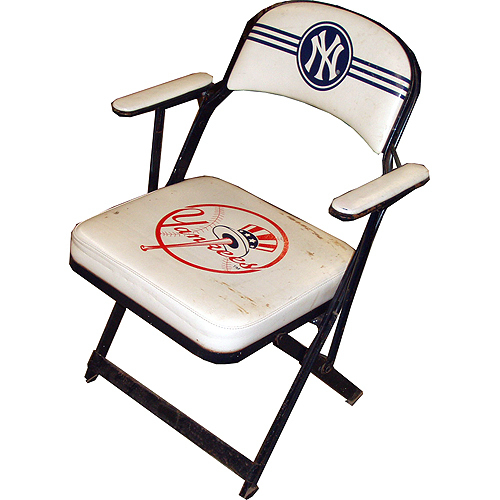 From its beginnings in 1923, to the minor renovations in 1928, 1937, and 1946 to the major renovation in 1974-75, until its closing in 2008, seats from Old Yankee Stadium are quite cherished. 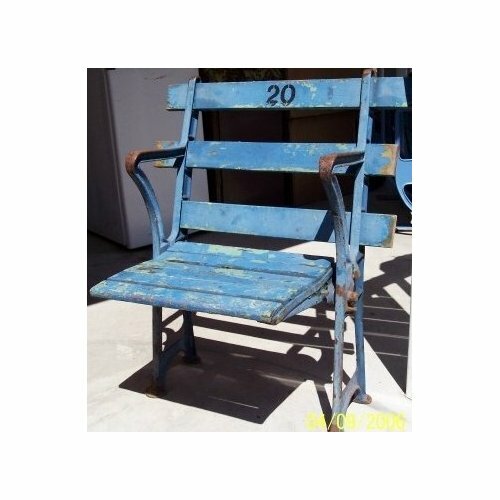 I created this page to help share the story of seats from Old Yankee Stadium as well as detail the history of the stadium seats. 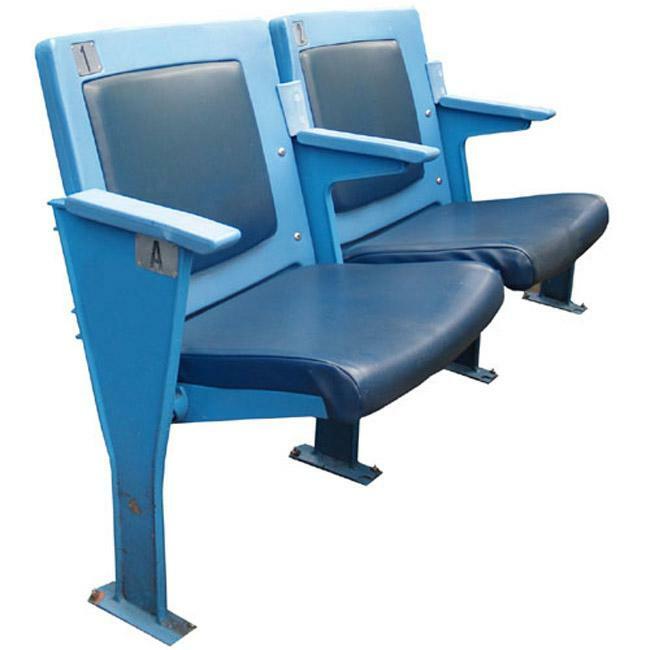 As I began to research the history of the seats from Old Yankee Stadium, I found that getting accurate and detailed information was quite difficult. This page is a work in progress and I welcome feedback and input to make it as accurate as possible. Thanks and enjoy! 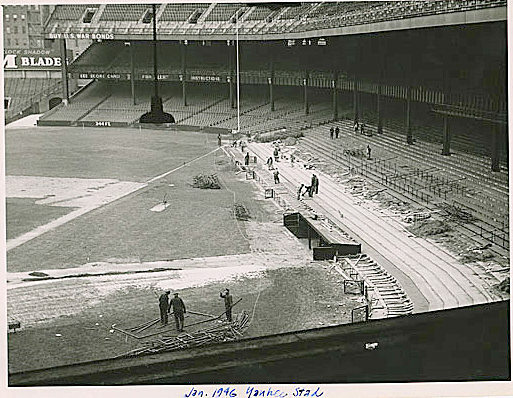 Here is Old Yankee Stadium being "renovated" in January 1946. 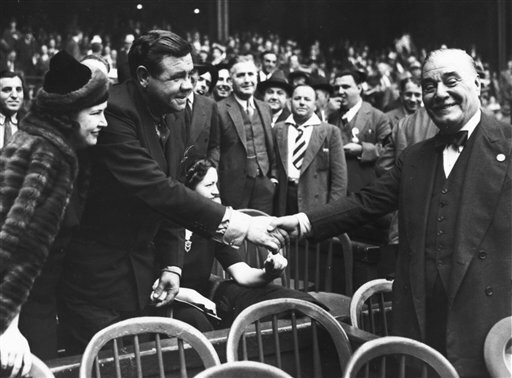 1946 saw the addition of the lights, the new Stadium Club, the installation of the dugouts, and the new clubhouse. 1946 also marked the stadium repaint to the pastel blue color. It was in 1946 that the Windsor wooden seats were "retired" and permanent seats were installed to take their place in all 3 decks. 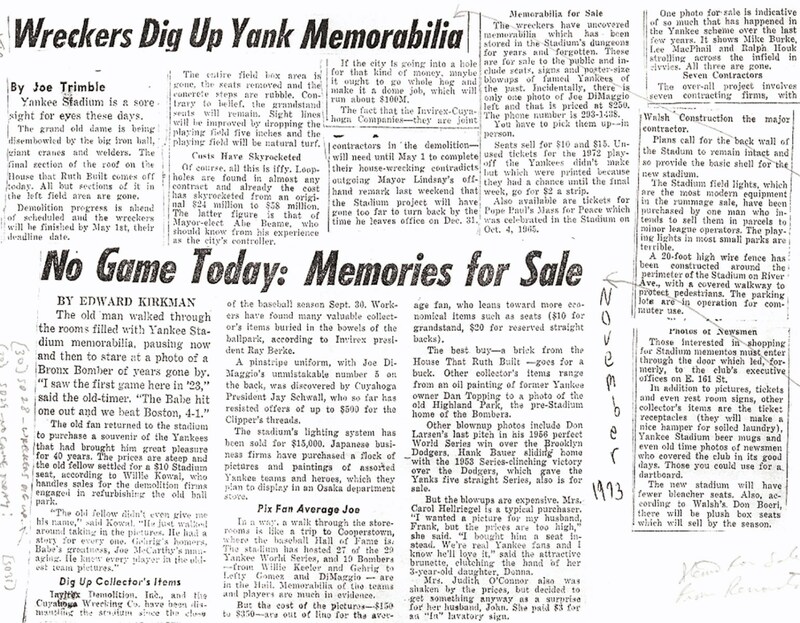 As we know, the last game played at Old Yankee Stadium before the major renovation was played on September 30, 1973 against the Detroit Tigers. The Yankees lost that game 8-5. Fans literally "ripped" any seat they could get their hands on. 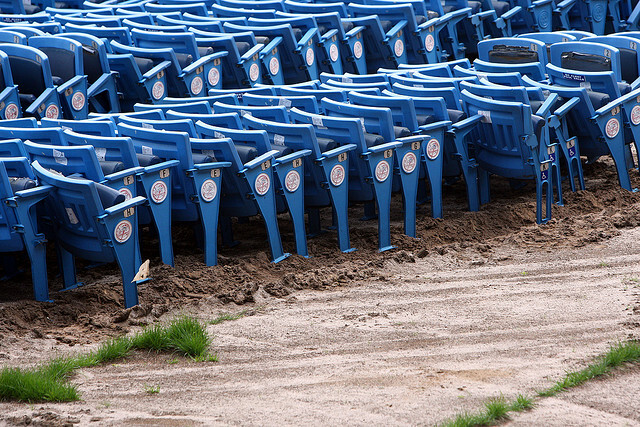 Many of the seats were taken out in whole sections, but most were taken out in parts. You can click HERE for some great shots taken from that historical day. Much of the information below comes from Harry Swanson and Mike Hagan. 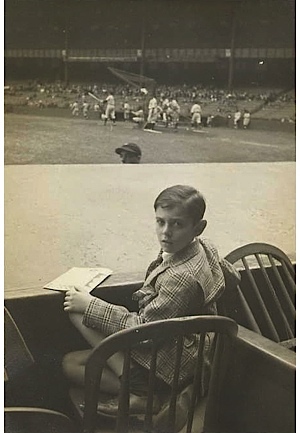 Harry Swanson is not just a Yankees Historian, but also the author of "Ruthless Baseball". You can find his book at Amazon. It is a must have for any baseball historian or Yankees fan. You can also download his book to your Kindle here! 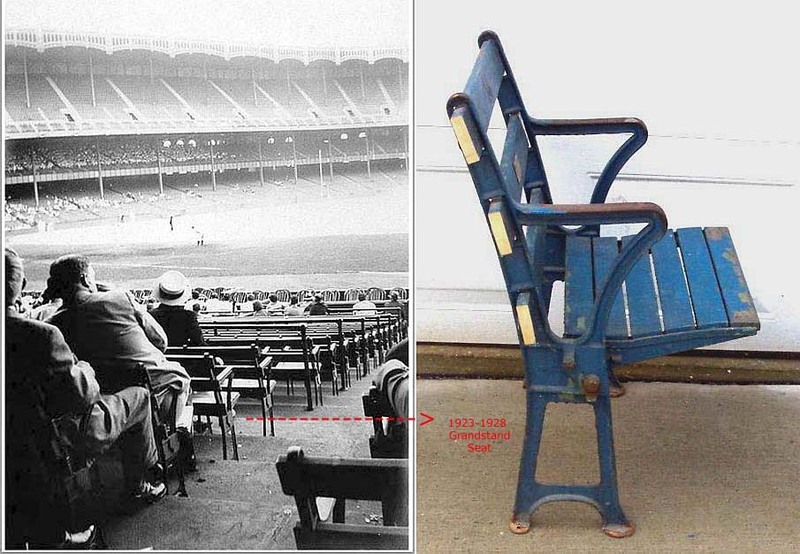 Early Adoption of the Seats: As we know, Old Yankee Stadium opened in 1923. The original stadium was equipped to hold approximately 57,898 seats. Of these seats, the three grandstand levels consisted of 34,698 seats. The upper deck contained 10,712 seats, the mezzanine held 6,637 seats, and the lower grandstand held 17,349 seats. (Note: Author Harvey Frommer stated that the lower grandstand held 14,543 seats). 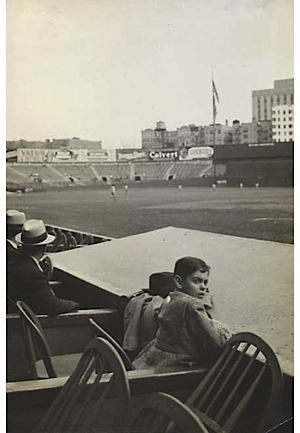 When the stadium opened in 1923, the stadium also contained "box seats". These "boxes" contained 1, 200 wooden seats. 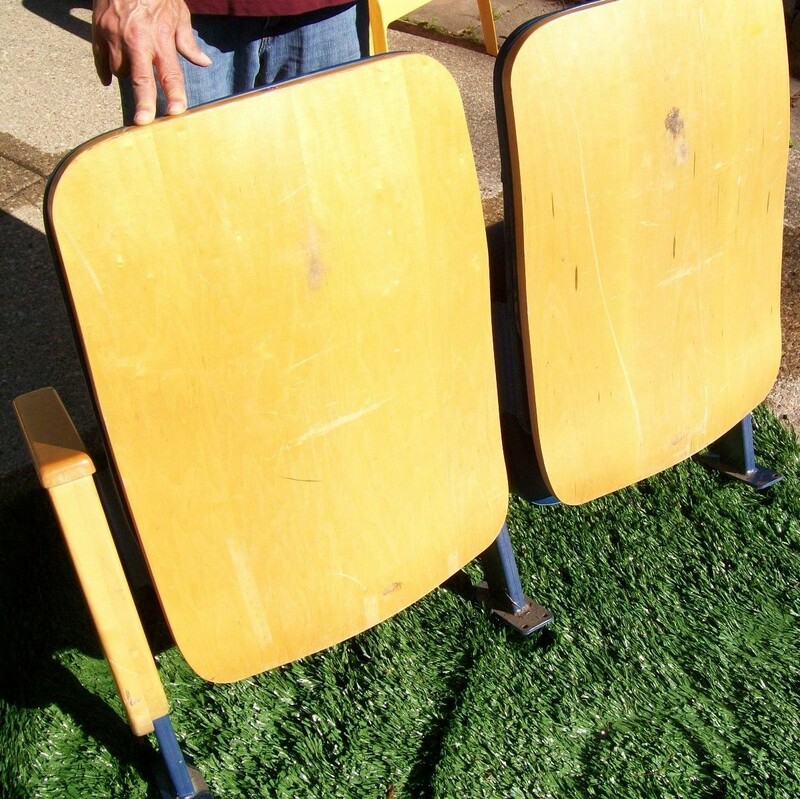 These free-standing seats were tilted on edge so they could be cleaned under after each game and also to allow the water to run off. Very few, if any, of these seats exist today. These Windsor wooden seats were placed in the first 4 rows of the lower section, the mezzanine, and the upper deck sections. 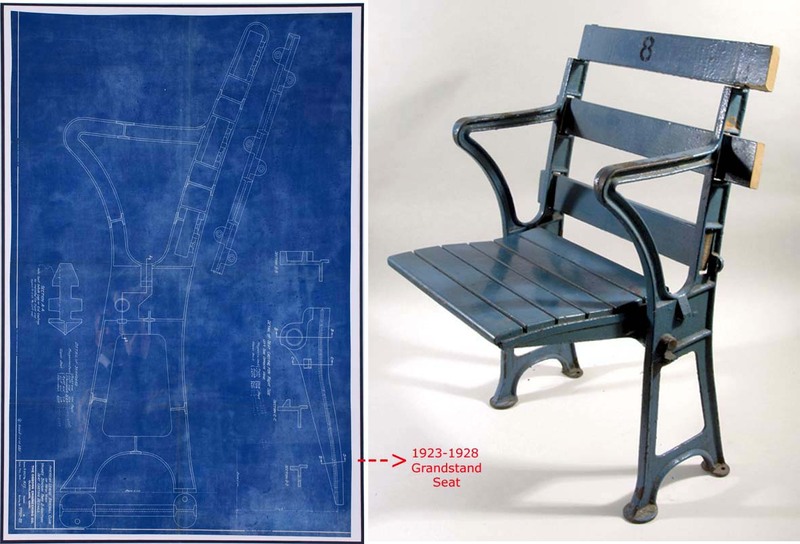 Seating Construction and Materials: When Old Yankee Stadium opened in 1923, all the seats were made of wood. To be specific, maple wood. 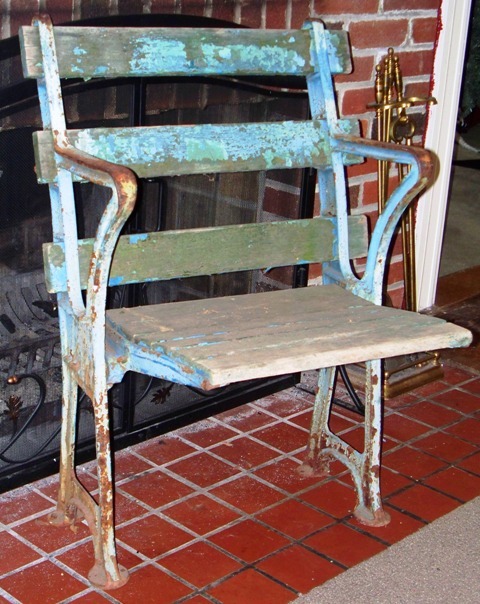 It was the Troy Foundry and Machine Company that furnished the metal pre-fab seat castings in 1923. 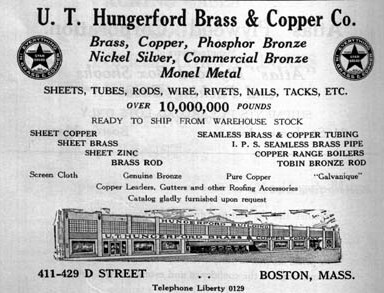 To note, in 1928, it was "The Eastern Malleable Iron Co." from Bridgeport, Connecticut that supplied the metal pre-fab castings. 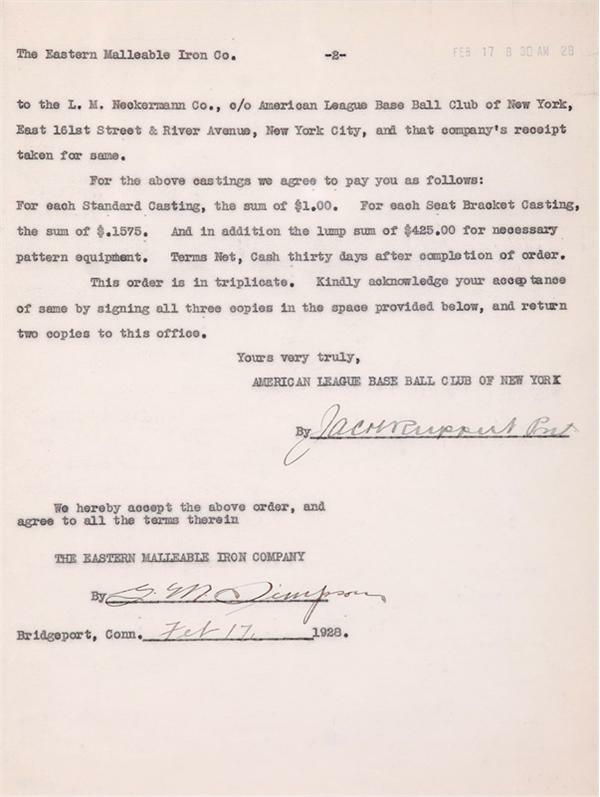 The documents below, provided by Yankees Historian Michael Hagan, verify this. 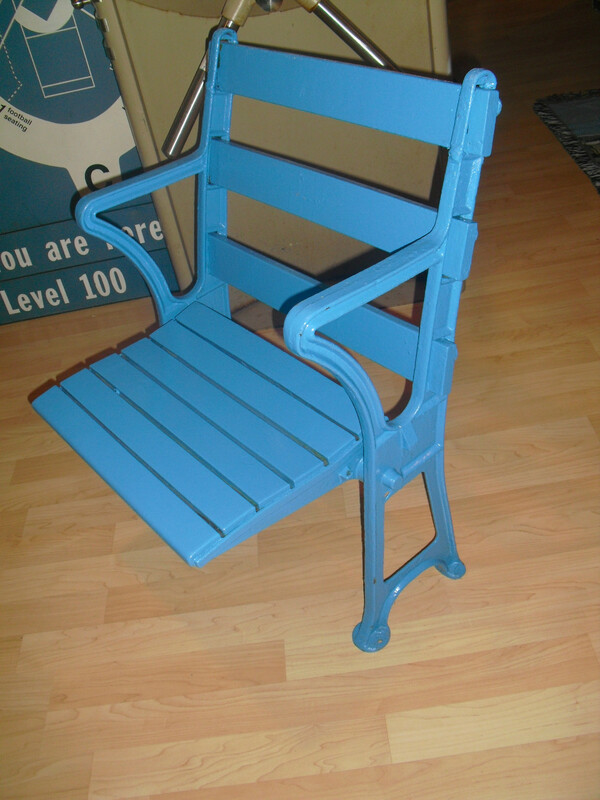 Each of these unique seats featured two upright arms and a back casting. 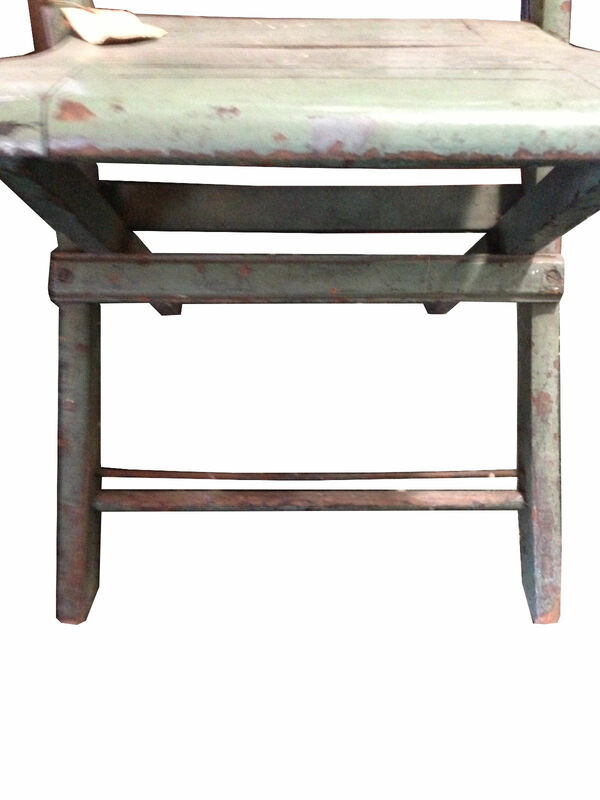 There were also two metal seat support runners that attached into the upright casting. 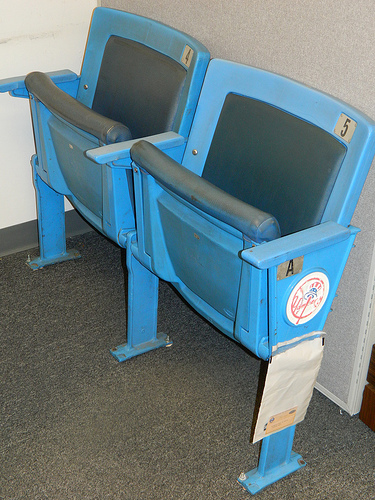 For cleaning purposes, these seats also tilted up in order for the floor underneath to be cleaned after each game. 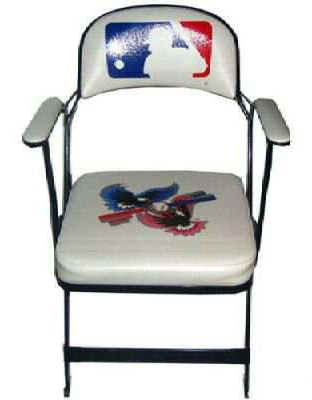 The seat supports swiveled into an upright position and stayed that way during the cleaning process and in between games. 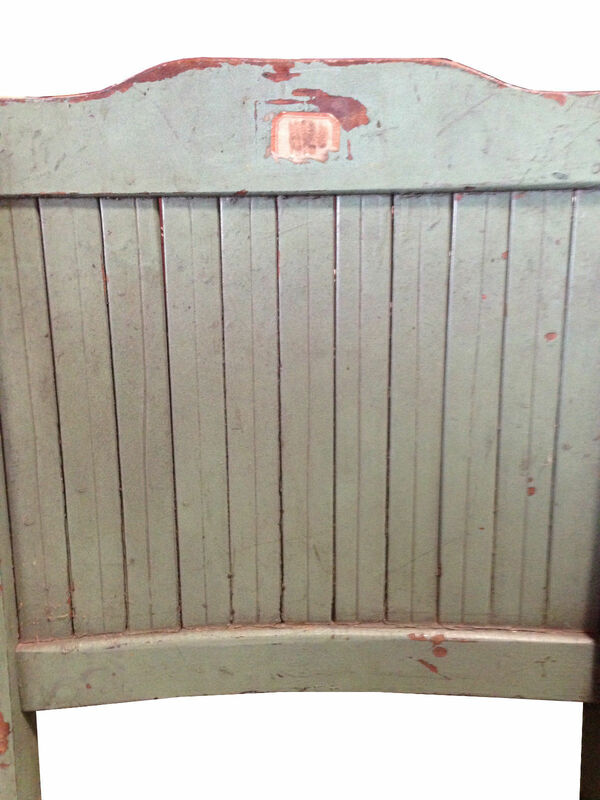 The wooden seat slats, which were made of maple, were milled on site. This was to ensure accurate and consistent measurements. After the maple wood seat slats were milled, they were attached and screwed down with 10 brass screws to form the bottom of the seat. After the seat bottom was completed, three more maple boards were milled, and they were placed through each of the two upright openings in which the upright casting would connect one seat to another. The process not only connected the seats, but also connected them. The last step was to attached these three boards with a total of 12 screws per seat. The company that supplied the screws was the U.T. 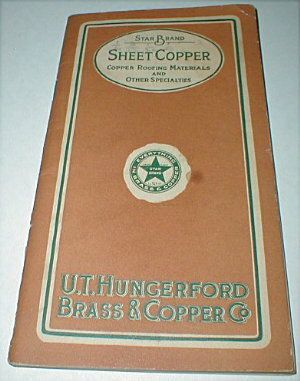 Hungerford Brass and Copper Company. 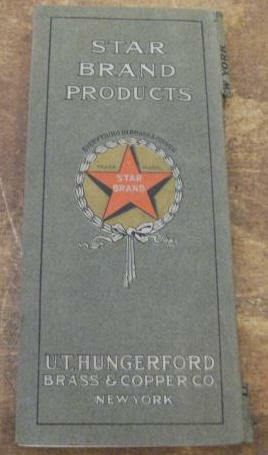 The company had locations throughout the United States, including New York. Their New York headquarters was located at 497-505 Pearl St, 37-43 Park Street in New York City. 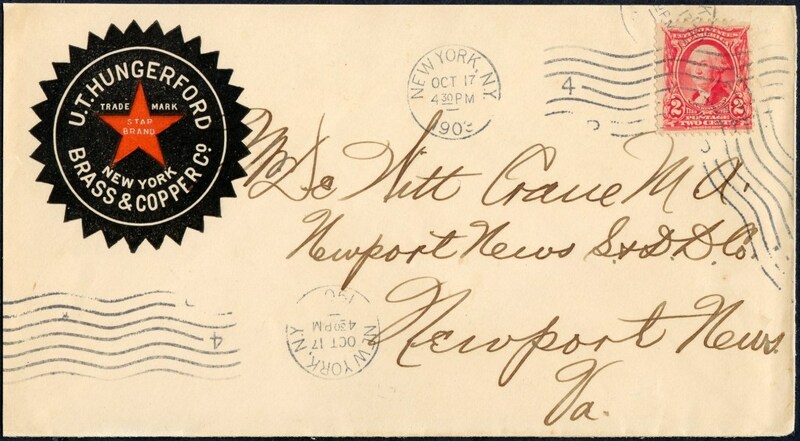 At one point, they had other locations in Philadelphia, Boston, Baltimore, and San Francisco. Below are some items I found from the company. 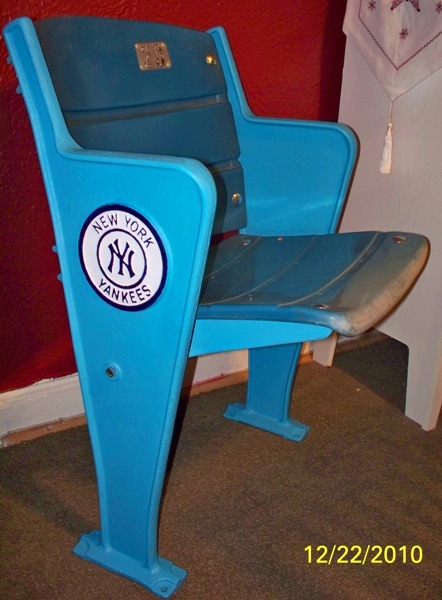 The seats from Old Yankee Stadium came in one version. This version was a floor mounted one. The vast majority of seats in the stadium in 1923 were the floor mounted ones. The flat feet would mount on the concrete floor. 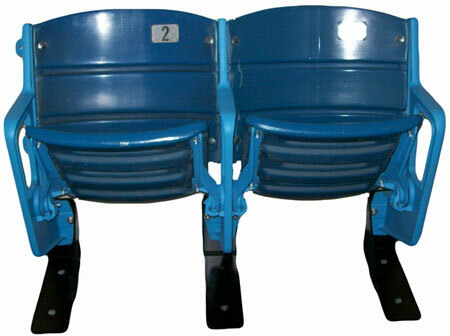 The seats that were mounted horizontally to the concrete flooring were "stepped" in the upper levels of the grandstand. Below are some images of the original wooden seats in the stadium when it opened in 1923. 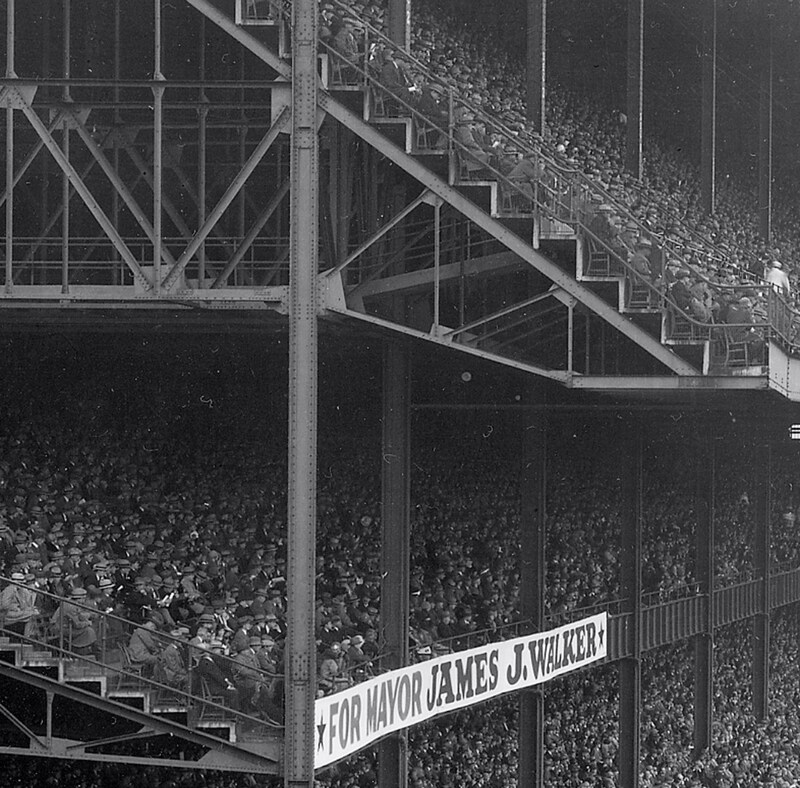 The bleachers in 1923 were also constructed of wood. The entire structure, including the seating, was entirely wood. The story behind this is that the grandstand seating was made of wood because it was designed to be "temporary" and built in stages. 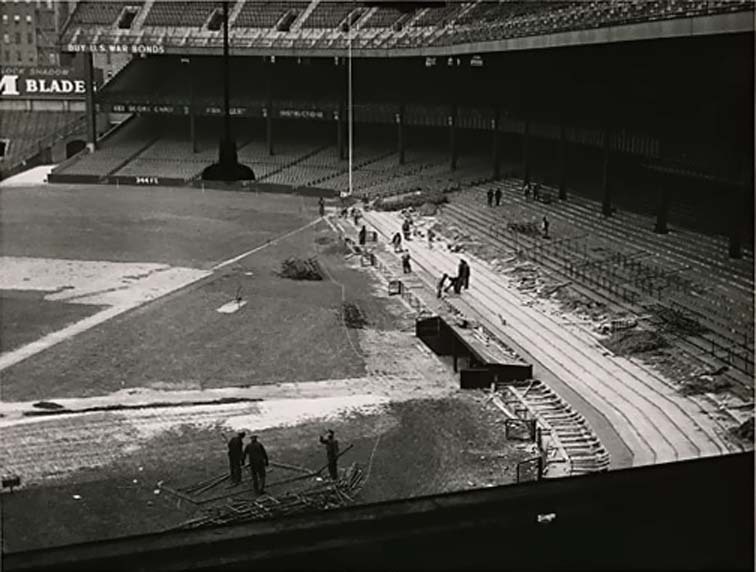 Later on the base and foundation of the bleachers was changed to concrete over many years. 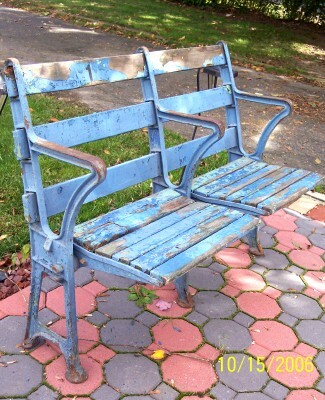 The seat itself remained made of wood. It is believed that in 1967, the seats were finally transformed to aluminum. The seat itself was gray with the grandstand itself being blue. 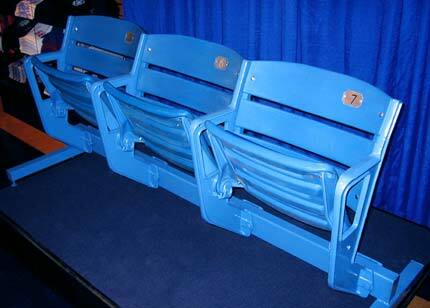 Interesting Fact: Yankee Stadium, Cleveland Municipal Stadium, and Fenway Park used the same style grandstand seats. 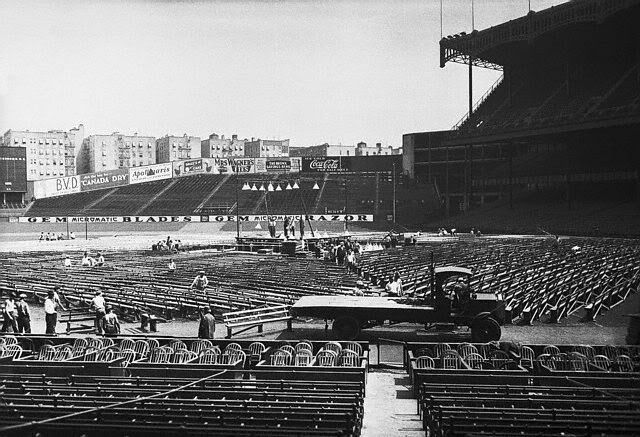 However, the 1923 and 1928 grandstand seat was unique to Yankee Stadium. 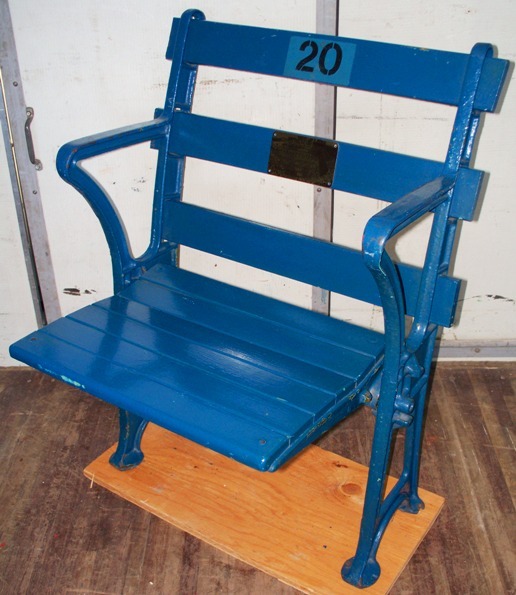 The 1937 Yankee Stadium grandstand seat was similar in design to the 1923 and 1928 version, but a checkerboard pattern was added to the area where the seat bottom locked into the arm rest. 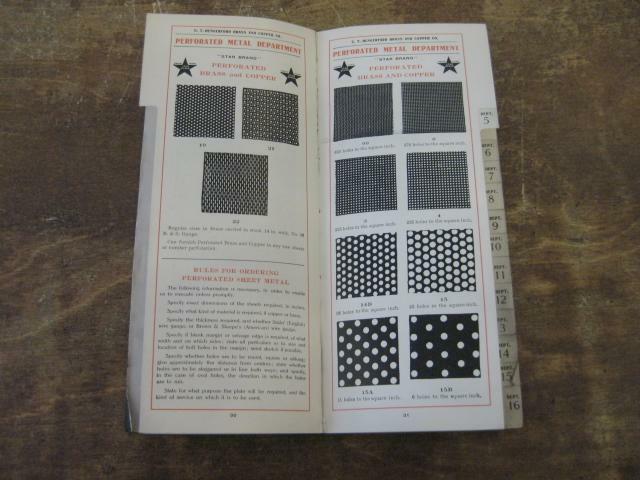 This same style checkerboard pattern was used in Cleveland and Fenway. 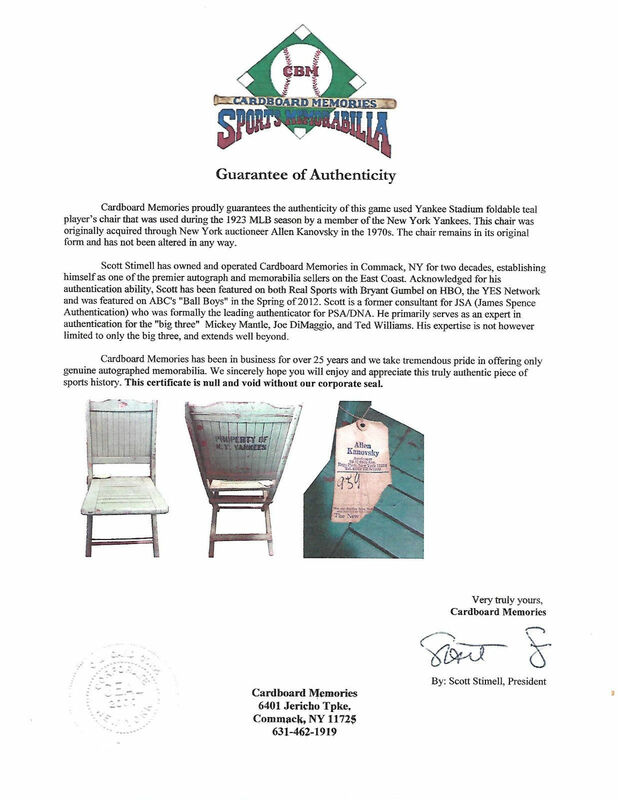 It has been noted by many sellers that they only true was to authenticate a seat from the Old Stadium was by the original paint. A number or two appears on some arm rests, but not all, and these numbers cannot be considered a serial number. 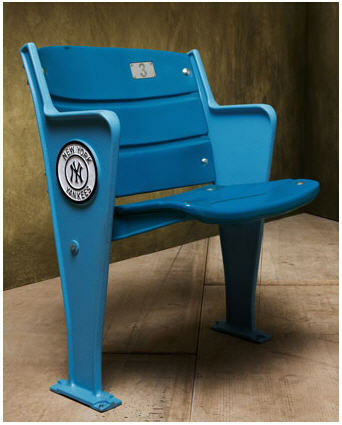 Installation: All of the seats in Yankee Stadium were installed by George Cornell and his company. He was paid a fee of 50 cents for each seat installed. Most of the seats were 18 inches in width from center. The reason some seats were not exactly 18 inches and that some had to be made wider or narrower because of the locations of the steel upright columns. In all, approximately 80,000 holes were drilled into the concrete in which the seats were anchored. These bolts were provided by the Expansion Bolt Company. In my research, I have only been able to find a company called "The Arro Expansion Bolt Company". I cannot confirm if this is the same company or not. 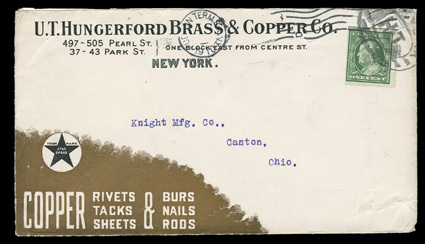 I did find that the Arro Expansion Bolt Company was incorporated in the state of Ohio, with office in Columbus. I was able to find a "Popular Mechanics" magazine dated September, 1956 with a nail anchor from the Arro Expansion Bolt Co. The magazine stated it was located in Marion, Ohio. 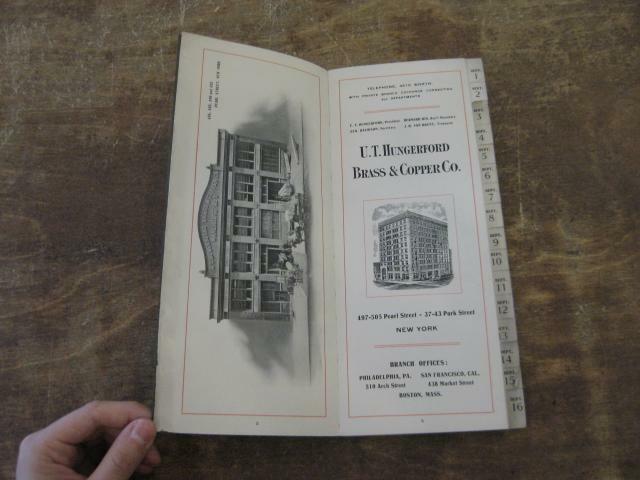 I was also able to track down a book that stated that "William Eikenberry" was the General Sales Manager for "Arro Expansion Bolt Company". 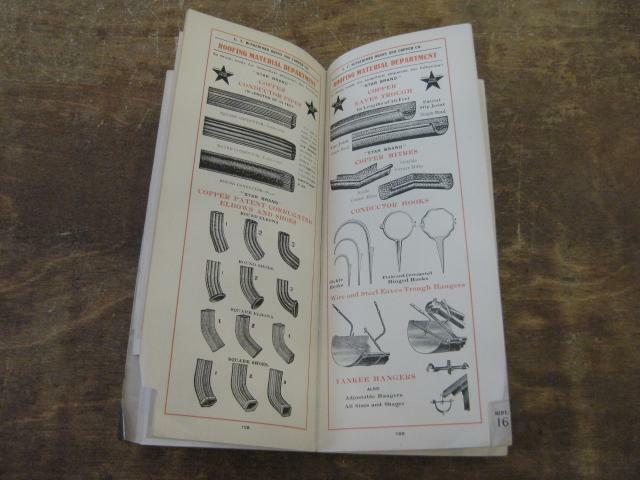 This book was from 1963 and entitled "Mechanical Fasteners for Wood - Publication No. 1003". 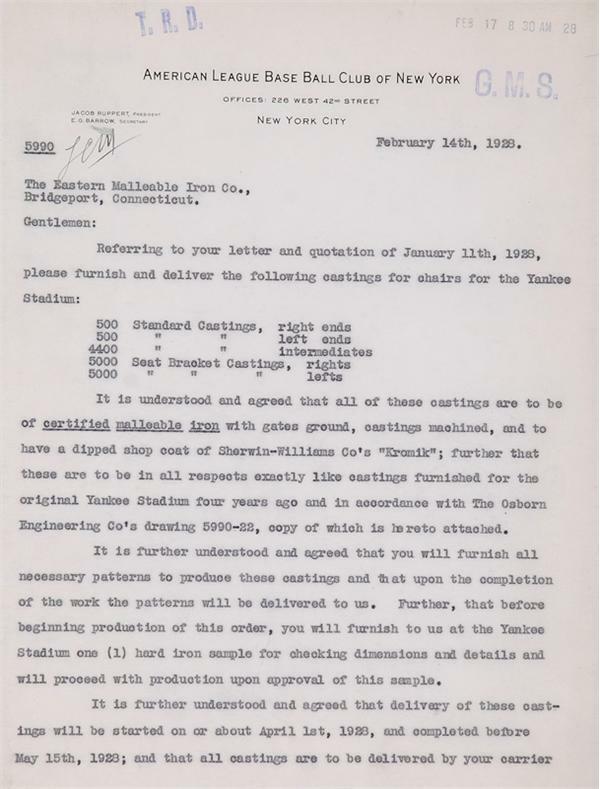 In continuing my research, I was able to locate a "Display Support" patent for February 6, 1934, Patent Number 1,945,806 signed by George R. Flora for the Arro Expansion Bolt Company. 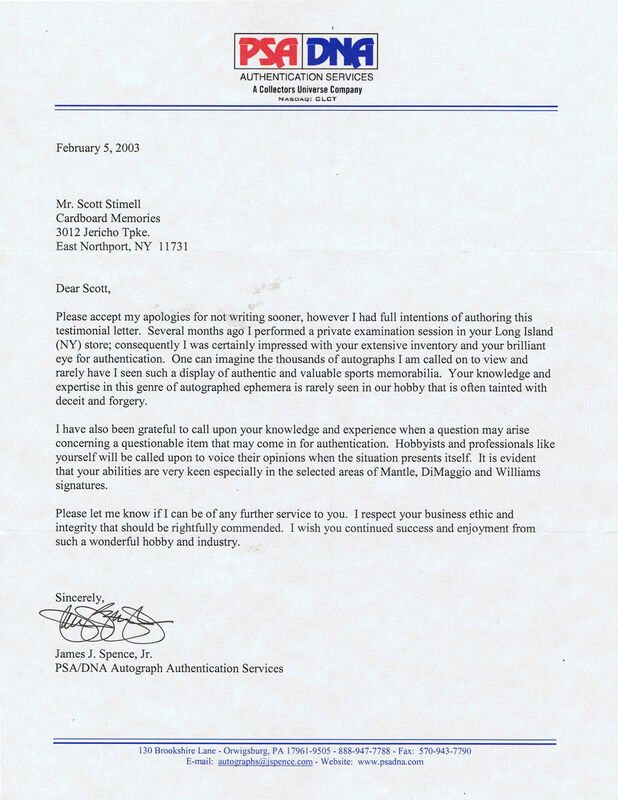 At this point, I am going to conclude that these were the same company but I will continue my research further. Over 800,000 brass screws were used to install the milled maple to the metal castings. (According to Author Harvey Frommer, over a million brass screws were used). 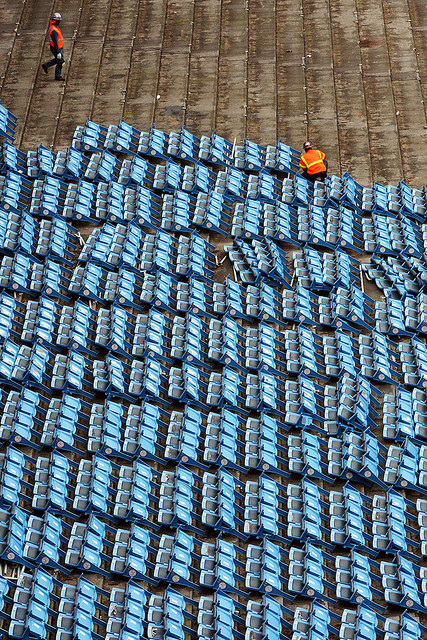 In the end, approximately 600,000 linear feet of maple wood was used to create the stadium seats. 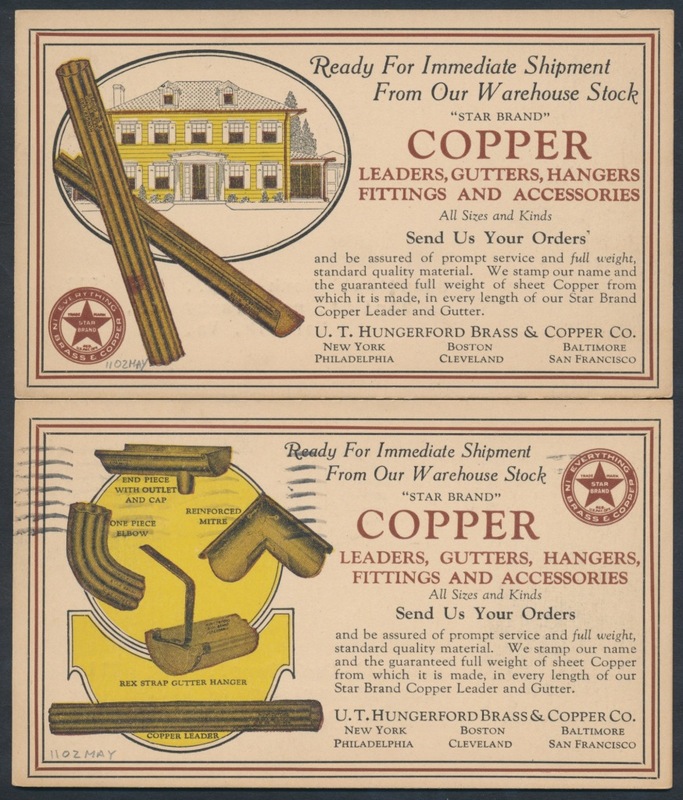 Of that wood, over 400,000 boards of maple were delivered from "Chittan Lumber", "Tisdale Lumber", and "Cress, Austin, and Ireland Lumber Company". 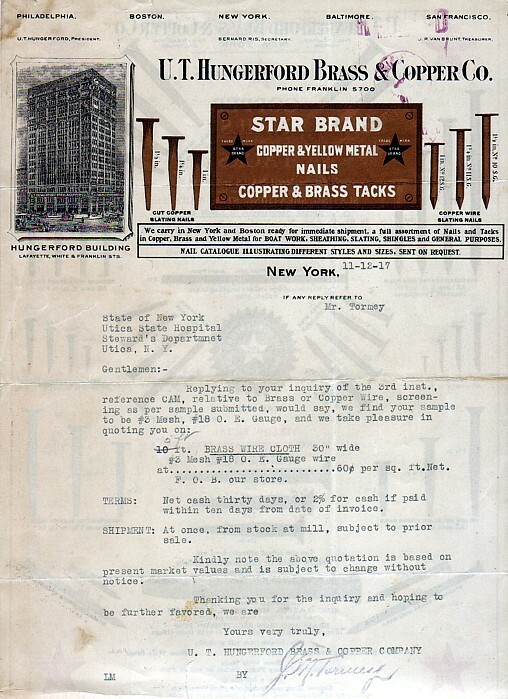 Tisdale Lumber was located in Astoria, Queens. In 1903, according to the New Tork Times, "The "Cress, Austin, and Ireland Lumber Company" had locations at Newtown Creek and Grand Street in Brooklyn. Approximately 115,000 castings were used to build the wooden seats. (Author Harvey Frommer stated that 135,000 metal castings were used). These metal castings were built by the Troy Foundry. The total weight of the castings was estimated to be around 500 tons. Seating Layout: One of the aspects of the stadium that was well noted was the width of the rows. There was plenty of space between rows for people to walk and move about. The connecting aisles were especially wide which was a huge hit with fans. Below is a photograph from 1925 showing the mezzanine and upper deck. Note the first four rows have the free-floating Windsor style seat and the rest the floor mounted flat wooden slat seats. In all, the three levels of stadium seating combined for a total of 80 rows. 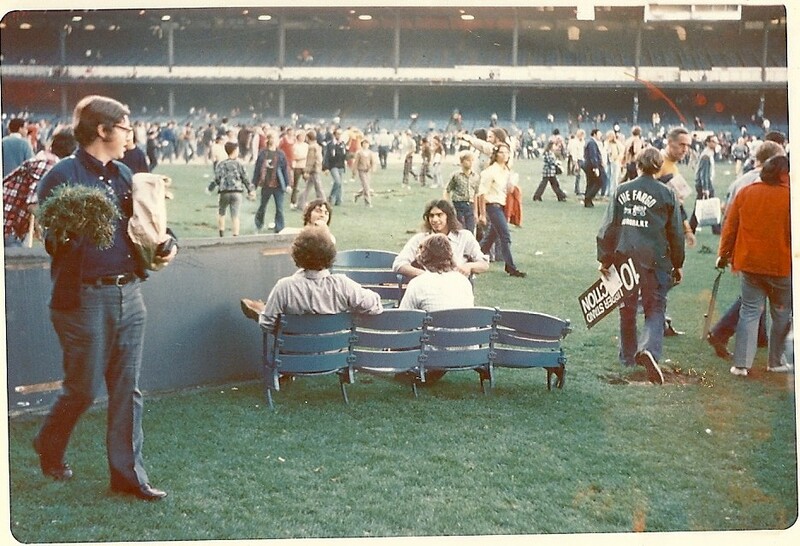 The boxes with the wooden seats were located in the lower field level, the mezzanine section, and the upper deck. These boxes were very spacious and offered lots of room for fans. Each "box" contained four wooden free-standing Windsor type chairs. 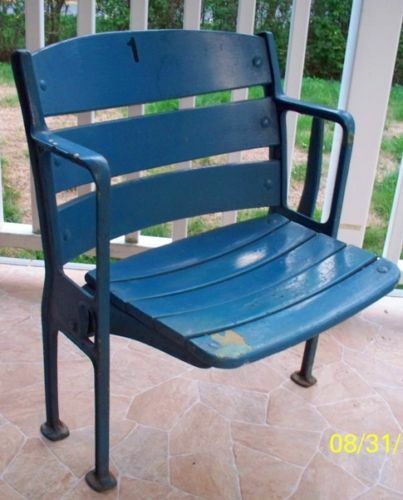 These were the high-back post type of seat. Each of the "boxes" in the lower deck was separated by partitions made of wood and concrete. In the mezzanine section, the "boxes" were separated by metal piping. Over 4 miles of piping was used to build the boxes, hand rails, and fencing. 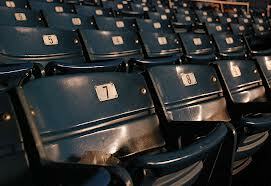 Below are some photos of the "box seats". 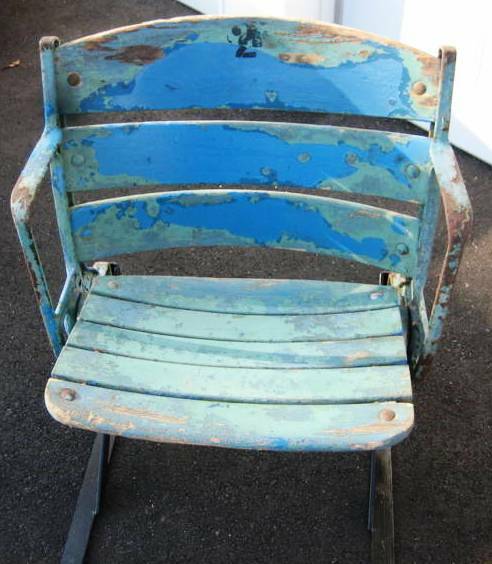 These Windsor seats are incredibly rare to find today. The last one that I saw at auction sold for almost $6,000. 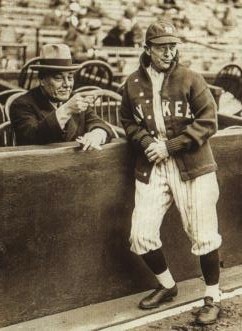 Pictured here is Miller Huggins and Ed Barrow at Yankee Stadium. 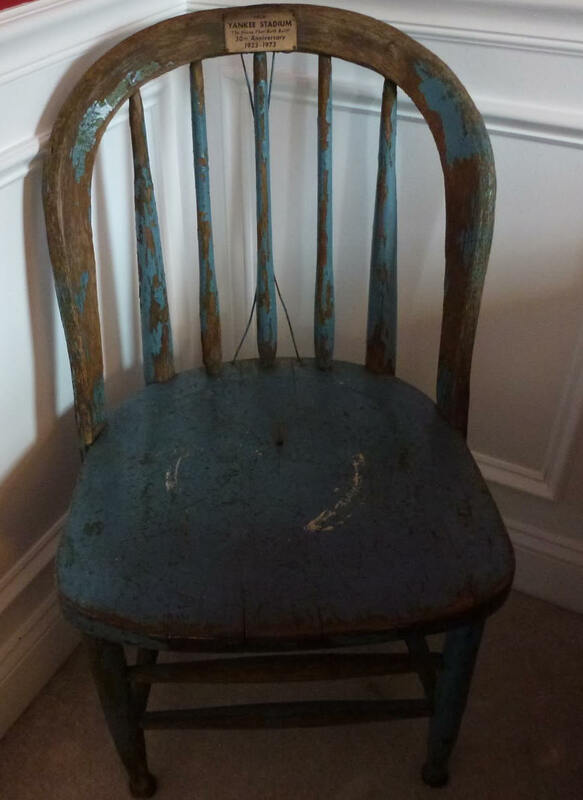 Barrow is seated in a Windsor Chair. 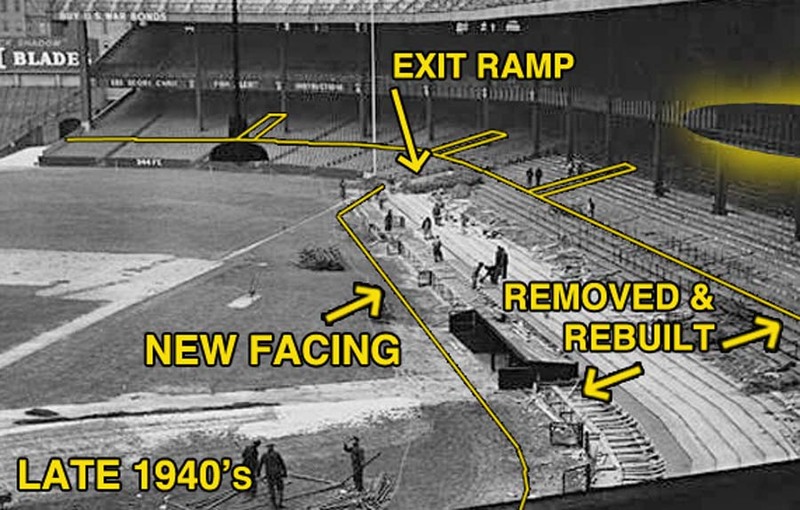 The renovation in 1946 saw many changes for Old Yankee Stadium. Below are 2 photos depicting many of the changes that were made. Cost: The approximate cost to build the original seats in 1923, not including the Windsor seats, was $85,470. 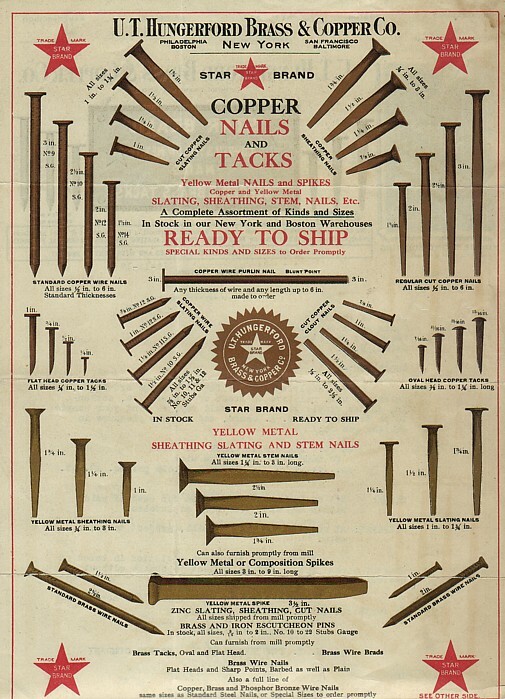 This included the metal castings, the wood, and the screws to assemble them. The cost of the stadium seats is separate from the cost of the bleachers. The cost of the bleachers was $116,697. 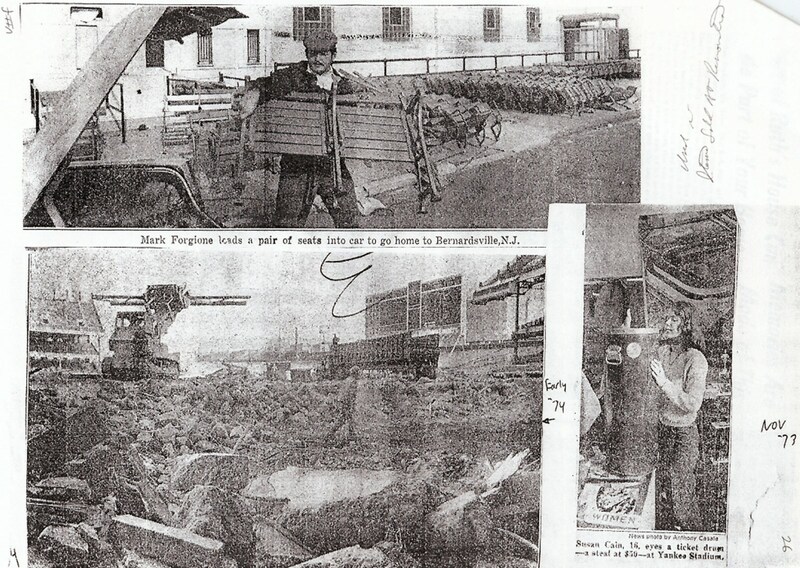 The cost of the bleachers included items such as concrete, insurance, steel, painting, finishing, pipe railings, and carpentry costs. 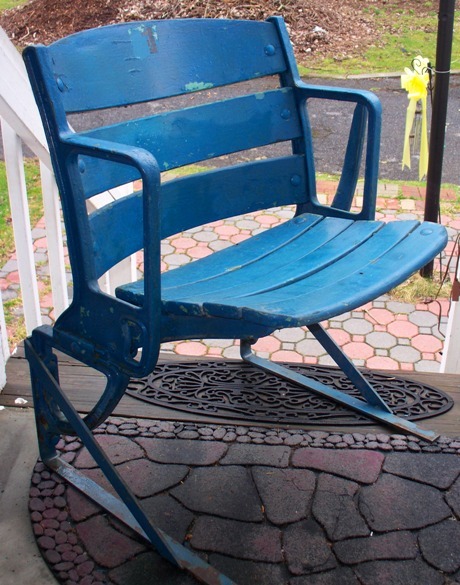 Note: The seat castings arrived at Yankee Stdaium with a dipped coat of Sherwin-Williams "Kromik". So technically, the first coat of paint would be called a Red Primer "Kromik". 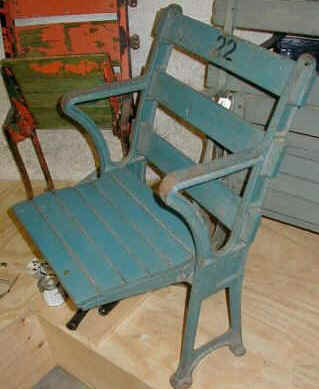 The curved back seats never had the original green paint on them that was used from 1923-1946. 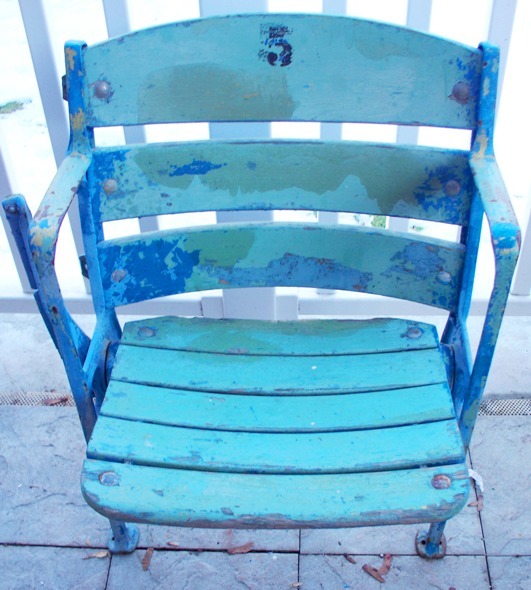 The curved seats did receive a layer of sea foam/mint green paint during the period of 1957-1966. 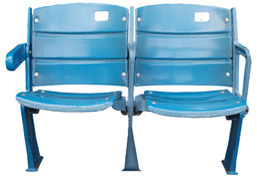 The curved box seats would have pastel blue, sea foam green, yellow primer (used only on the cast iron area of the seat), and royal blue. 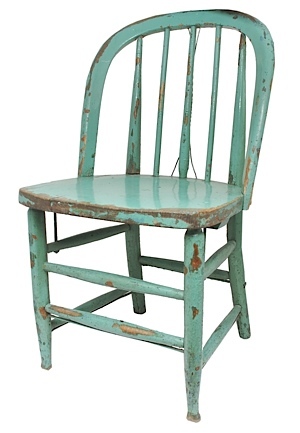 The sea foam/mint green paint was used in 1957 before the royal blue paint. The original color of the stadium that was olive/odd green would have been found on the grandstand seats. 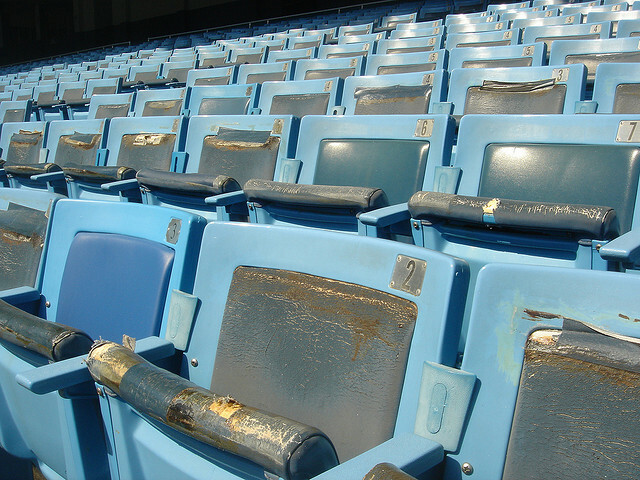 Many Old Yankee Stadium seats have a layer of yellow paint on them. This is authentic and should be there. 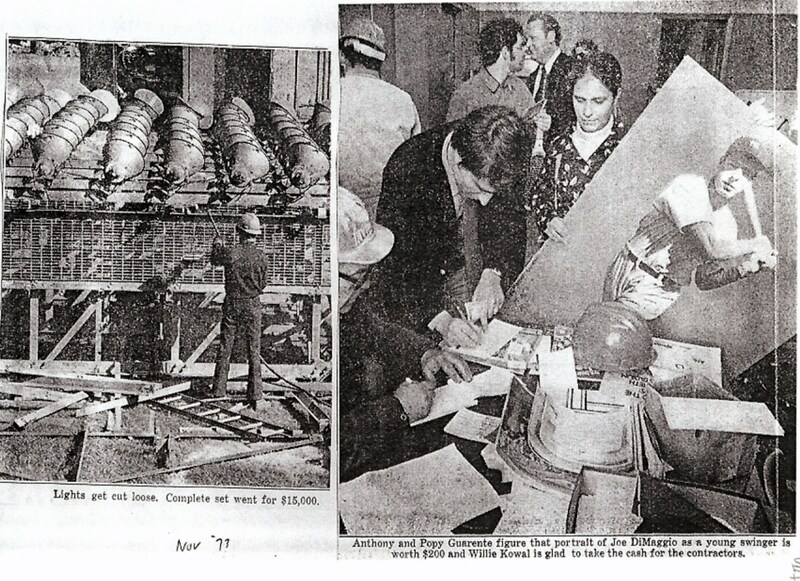 It was confirmed by historian Mike Hagan and United House Wreckers in Stamford, Connecticut, who also confirmed the yellow paint. 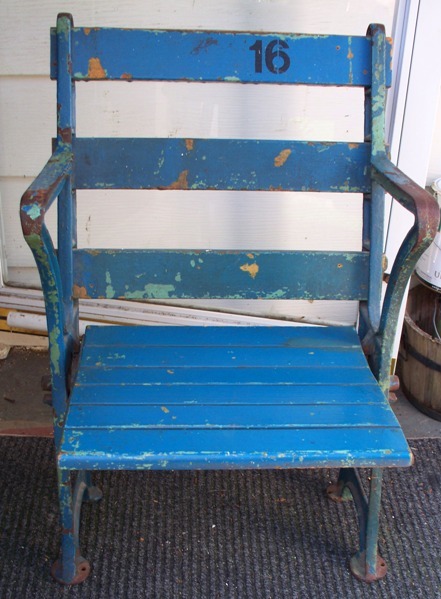 The yellow paint was a marine primer that was used to protect the seats. "the Olive Green of the vacant seats had almost completely been erased." 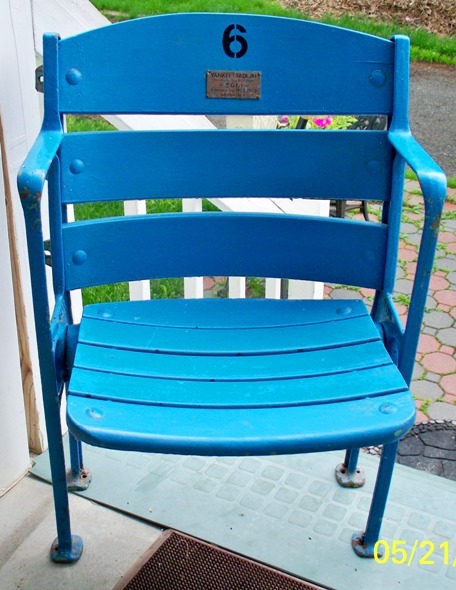 Yankee Stadium, Cleveland Municipal, and Fenway Park had a similar style Grandstand seat. 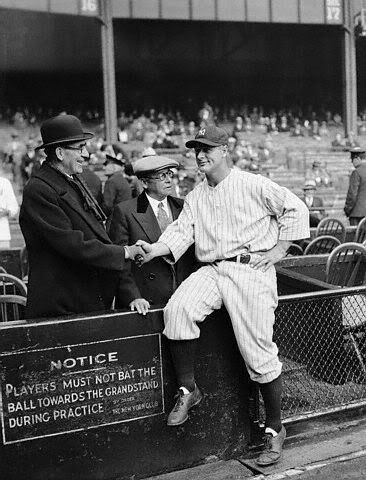 The first castings had been used in Yankee Stadium in 1923 and 1928. 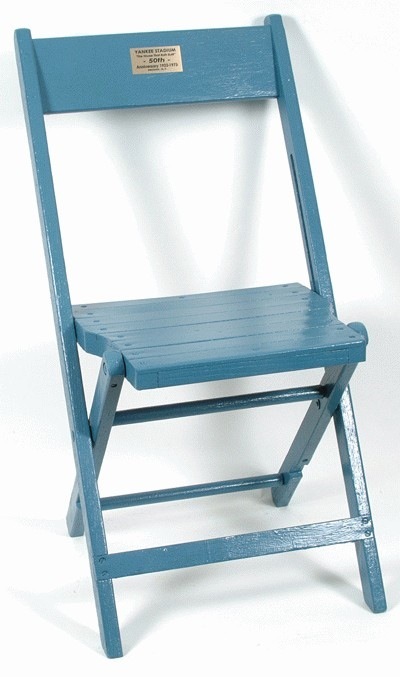 The style of the Cast Iron Arm Rests changed minutely in later years and a checkerboard pattern was added where the seat bottom locks into the arm rests. The checkerboard pattern was used in Cleveland Municipal(1931), Fenway Park(1934), and the 1937 Yankee Stadium expansion. Yankee Stadium was the only Stadium that had the non-checkeboard pattern. 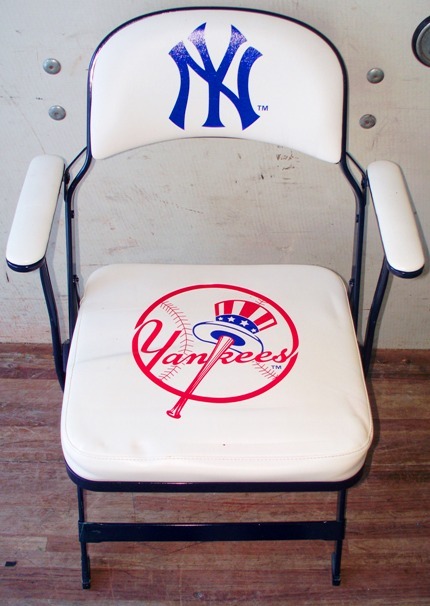 Seat Style: As we know, there were several different styles of seats used in Old Yankee Stadium. 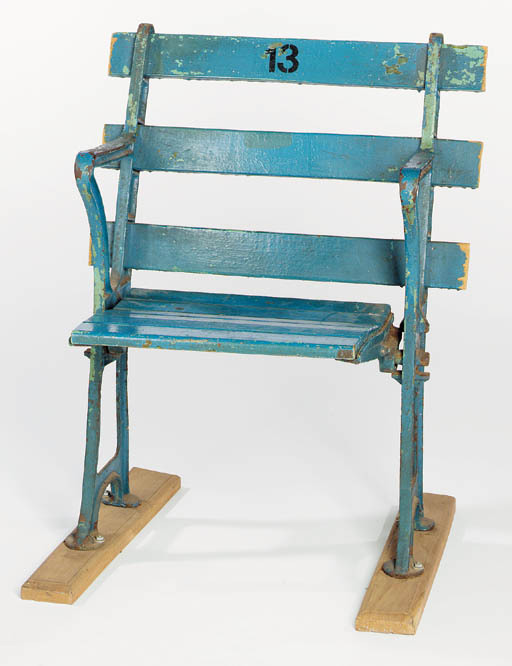 From the first seats made of wood, to the plastic seats of the modern ear, the stadium saw many different styles of seats. From straight wood panels, to curved wood, and then to plastic panels, each seat was unique and diverse in its own way. In the beginning, 1923 saw three different types of seats. 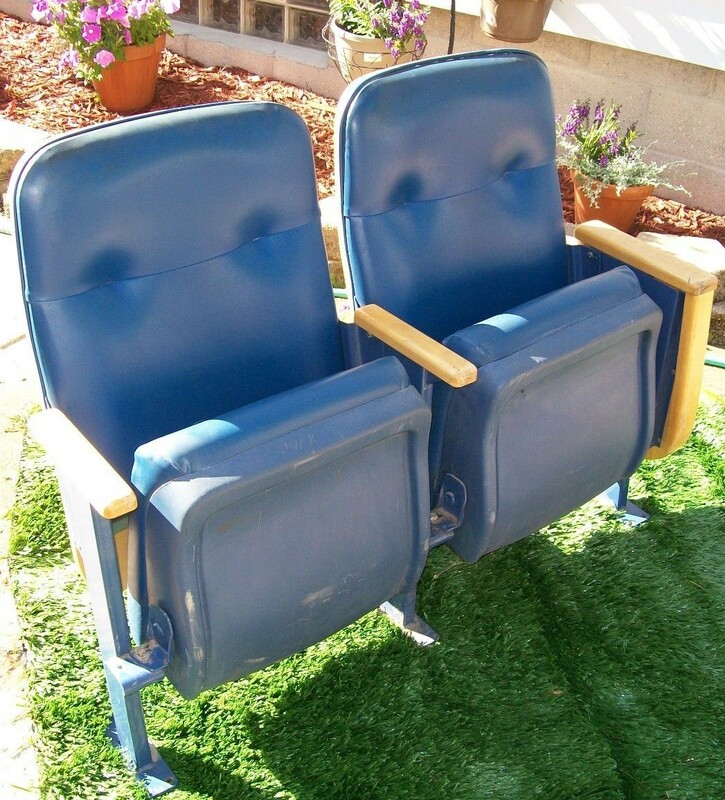 The floor mounted style, the horizontal concrete mounted style, and the free floating wooden Windsor seats that appeared in the "box" seats. The curved back seats were spring loaded so the seat bottom would "pop" up when the patron got up. 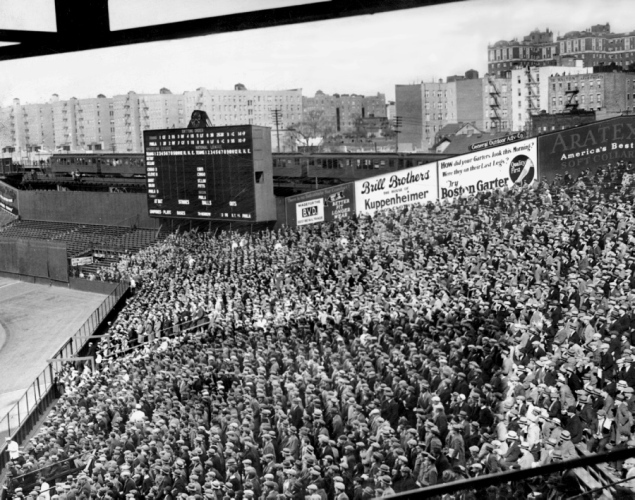 The 1937 style grandstand seat was also placed in right field. 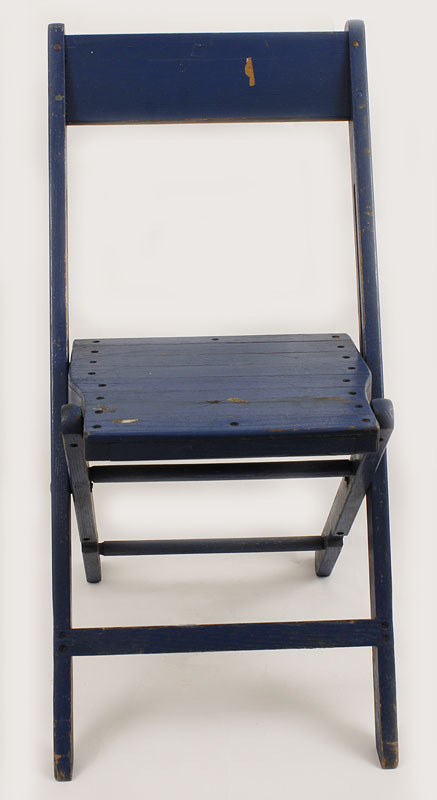 The 1927 style Grandstand seat was similar to the ones installed in Fenway Park in Boston and Cleveland Municipal Stadium in Ohio. 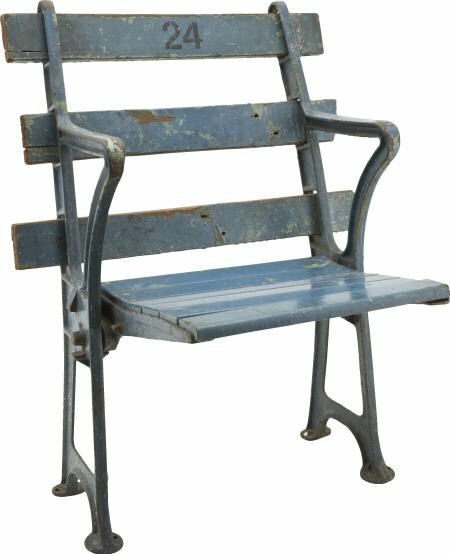 These were the same style seats as the 1923/1928 Yankee Grandstand seat with an added checkerboard design where the seat bottom locks into the cast iron armrest. 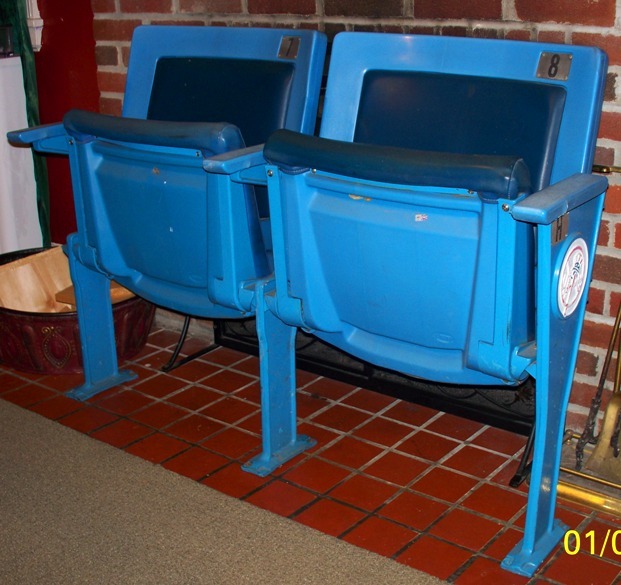 *Below are two great photos provided by Stephen L. who grabbed these seats after the last game in 1973! Great job Stephen! 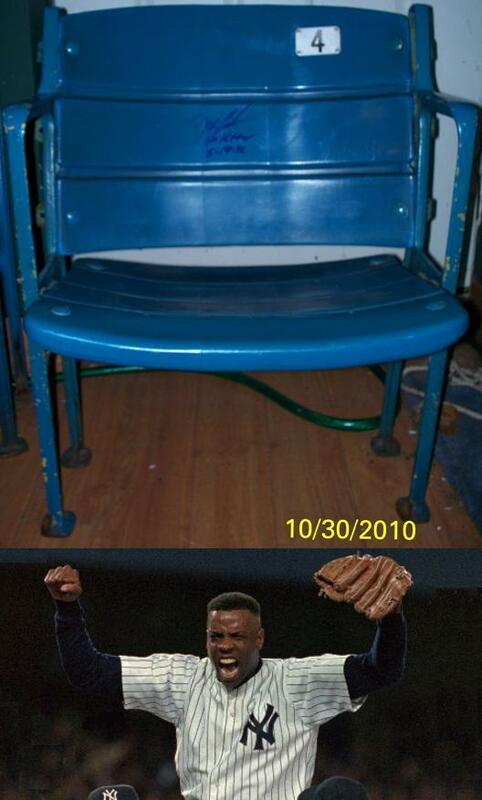 He still has the seats today, as pictured! 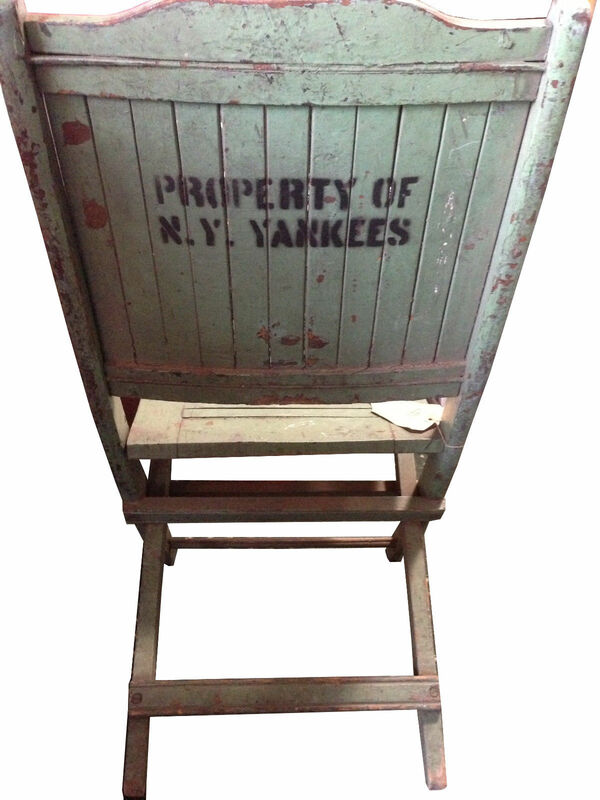 Below are 2 sections of seats from an Old Yankee Stadium Straight Back Seat. These sections are featured as to show to colors used over the years on the seats. The sections were given to me courtesy of Mike Wagner, noted historian and author of "Babe's Place". 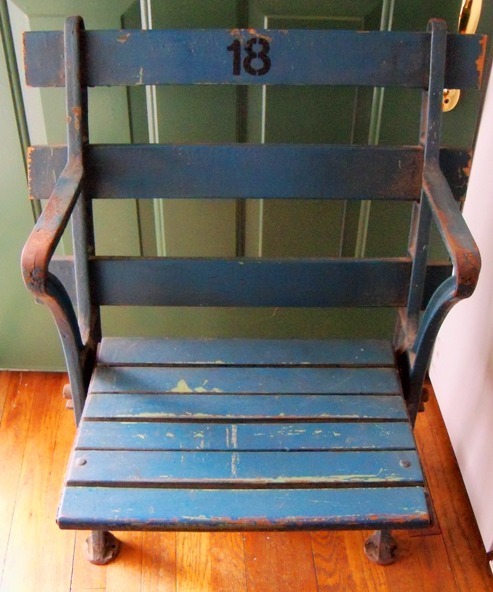 Below is a sample of a seat from 1923. The sections that I have are NOT from the seat pictured. Note: The images were taken with a Nikon D-60. Color = 24 Bit Depth Autofocus - A fluorescent light was used as well as a secondary lamp. A flashlight was also used in some photos to add more light to certain sections of the photos. 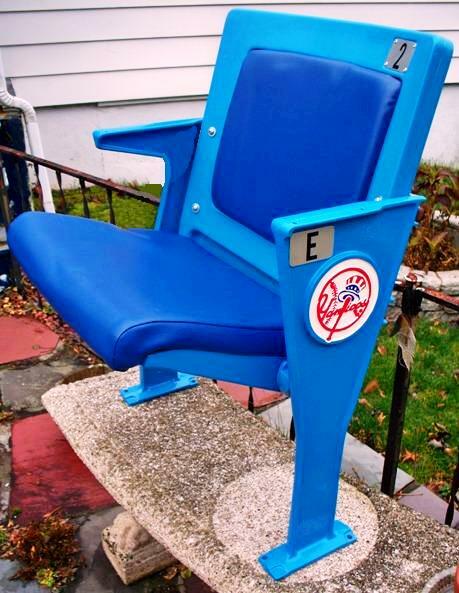 Below are photos of various seats that have appeared in Yankee Stadium. 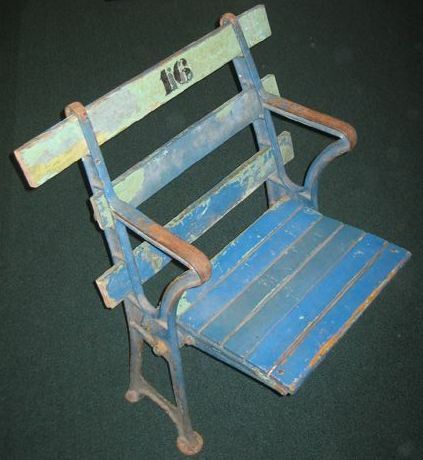 The Wooden "Box" Seat - Used when the stadium opened in 1923. 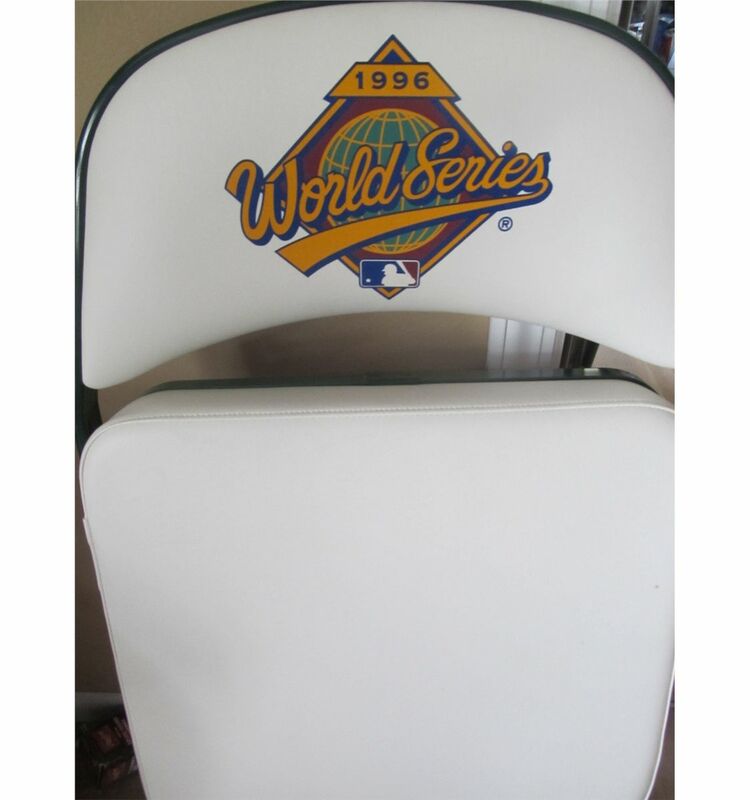 Below are some photographs of the seats. Look in the background in some as you will see the wooden box seat. 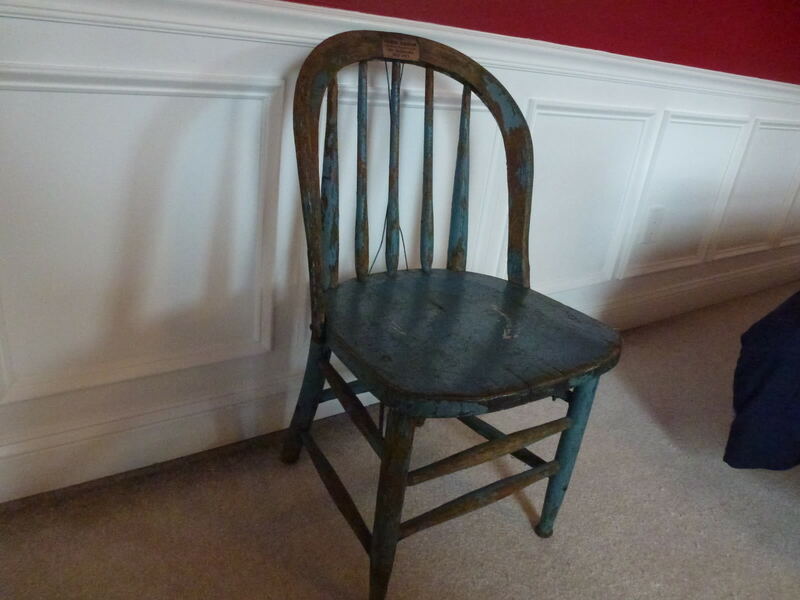 It was a high-back chair. 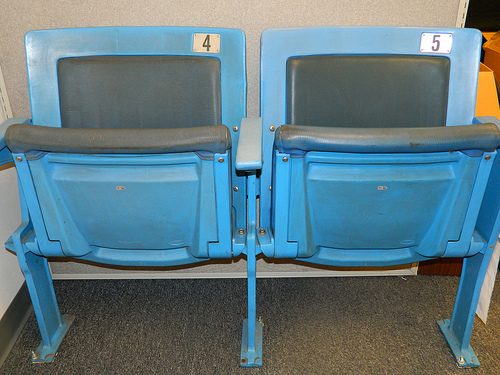 There is evidence that these seats were used at late as 1959. 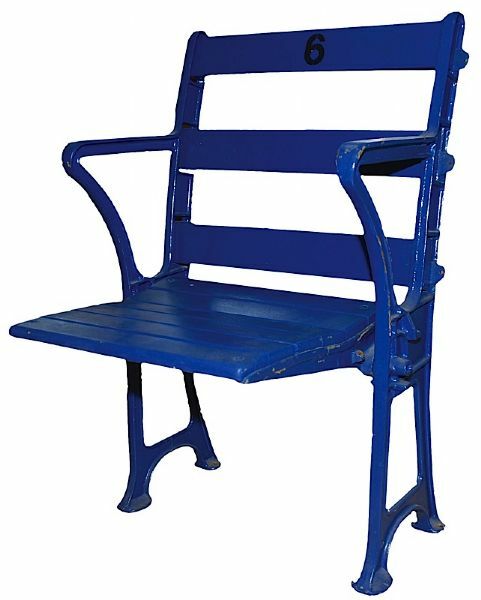 - Windsor seats shown in 1959. 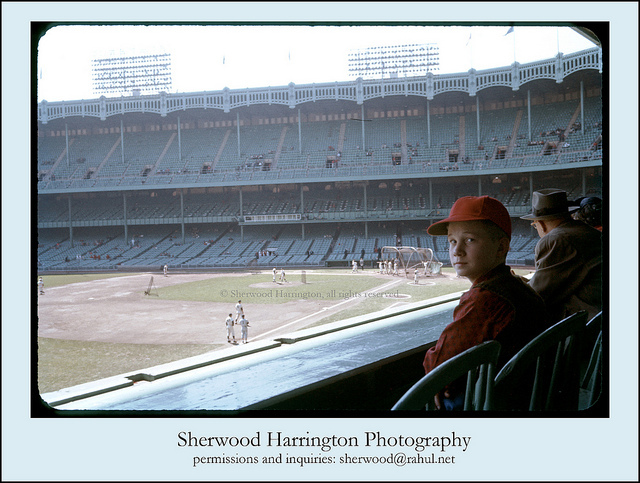 Thanks to Sherwood Harrington for the incredible color photo. The Original Wooden Seat - Some of these are shown in their "original" condition, some partially restored, and some fully restored. 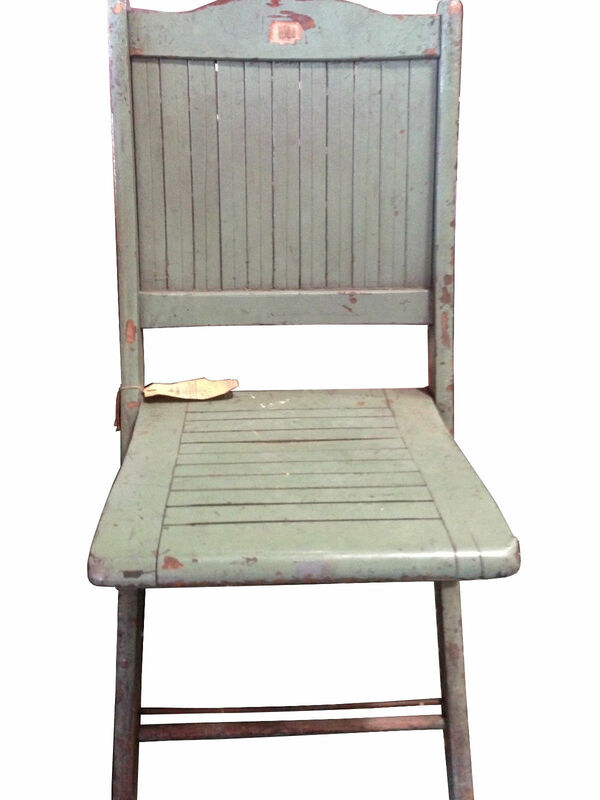 Most of the original wooden seats were floor mounted. The Wooden Curved Back Seat - Some of these were floor mounted and some of these were mounted to the concrete behind them. 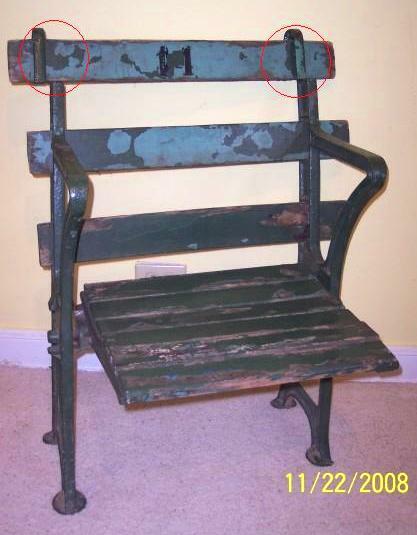 The "Commemorative" Seat - Note - The metal arms on these seats are NOT original. These are "Commemorative" arms. 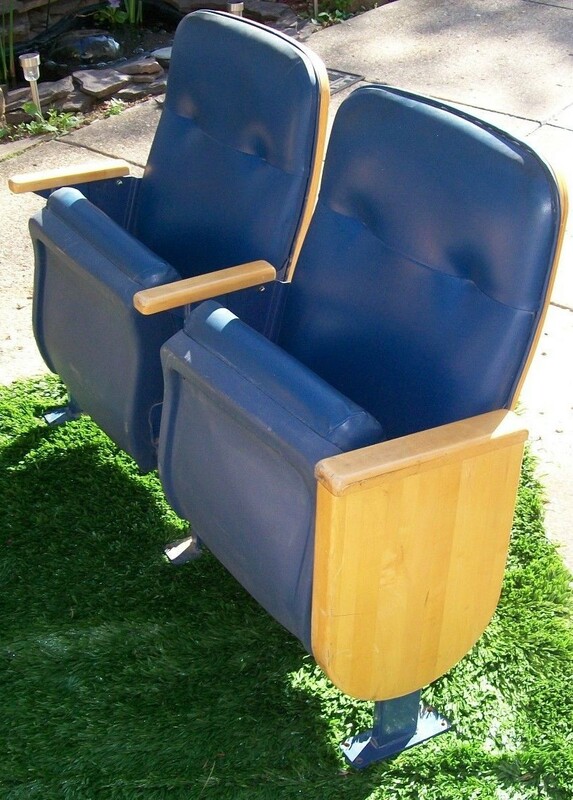 There are many people who bought these thinking they were original seats. They are not! 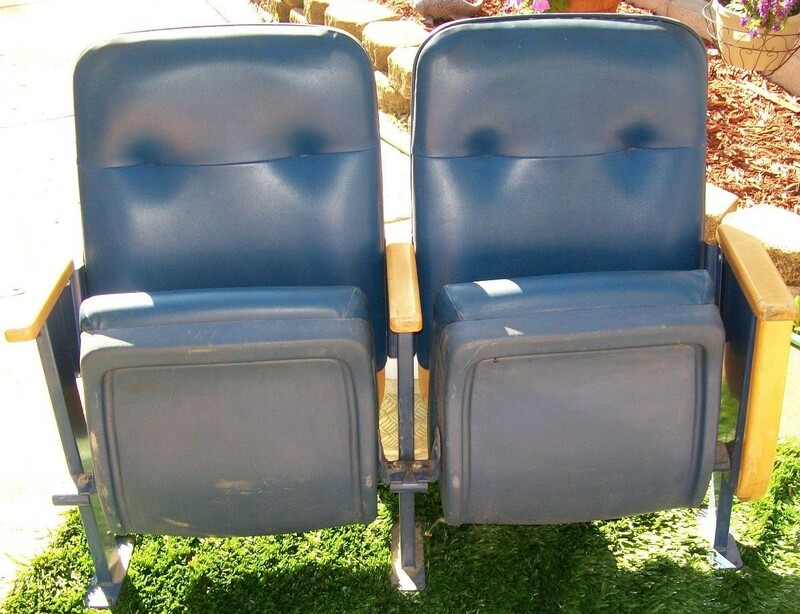 Only the seat bottom and seat back are from the original stadium. 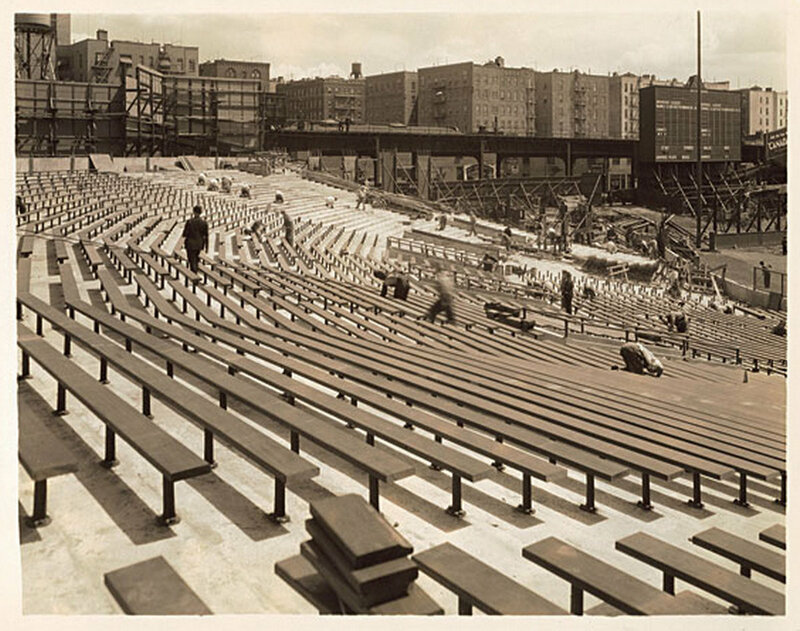 The Bleachers - The bleachers in the original stadium were made of wood until 1937. It was then that the bleachers were made of concrete and made permanent. 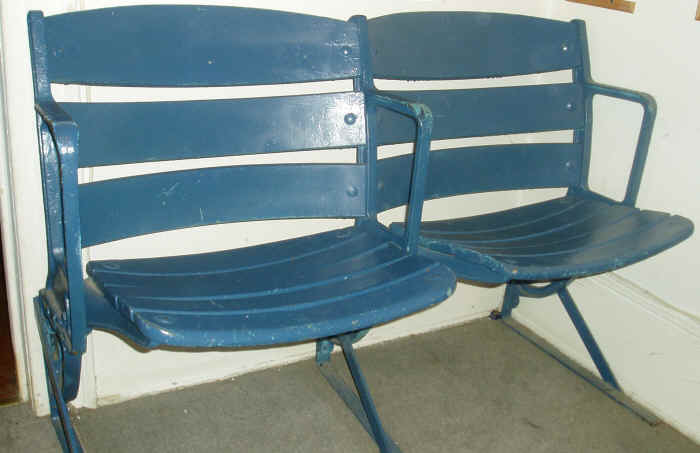 Locker Room Seats - Just a sample of some of the seats used in the locker room in the Old Stadium. The first two are from the 1920's and the rest are from the 1990's through 2000's. 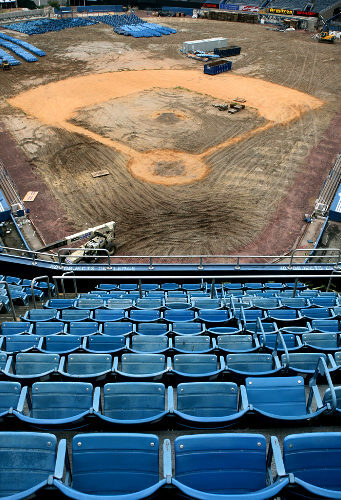 Old Yankee Stadium Renovation - The End of an Era: As we know, the renovation of Old Yankee Stadium ended the ear of the wooden seat in the stadium. 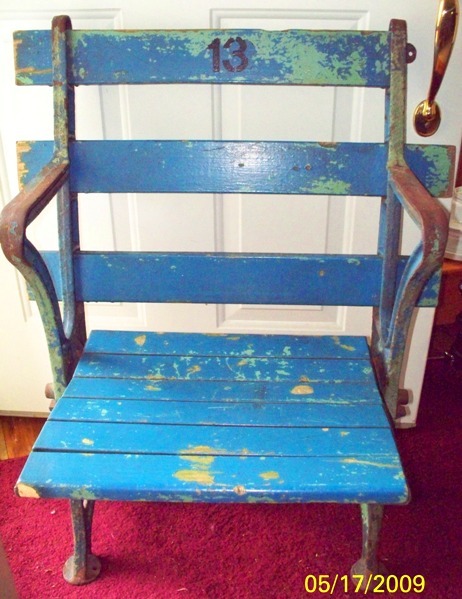 The 2-year renovation saw the end to the classic wooden seat. 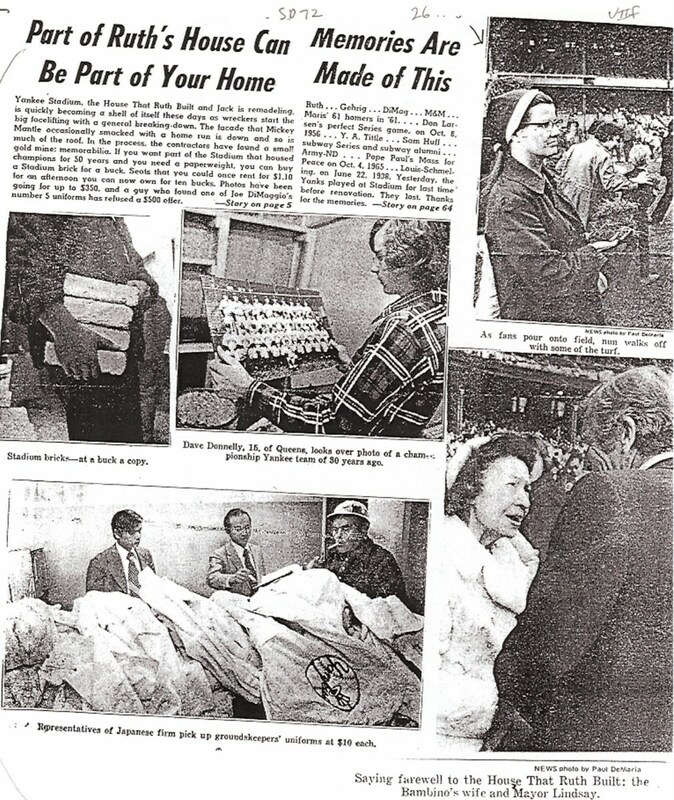 Below are some newspaper articles that appeared in local newspapers as the stadium was literally gutted. Thanks to Mike Wagner for these articles. 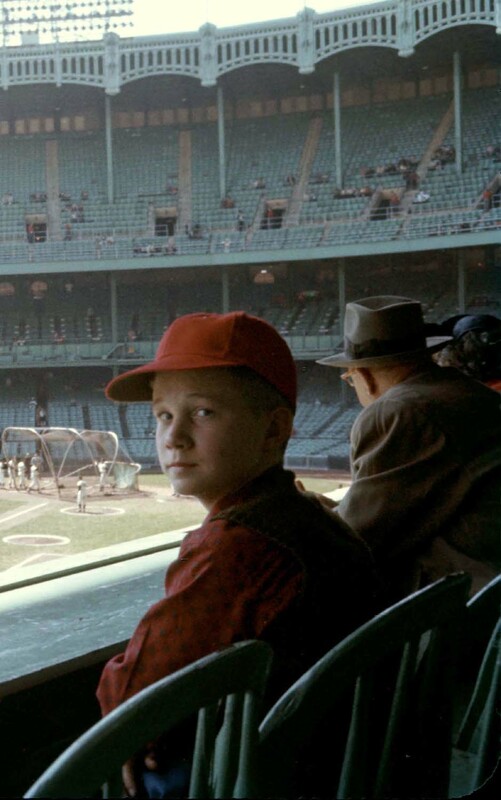 Tales from a Fan - A true Yankee fan and friend had sent me an e-mail I wanted to share. 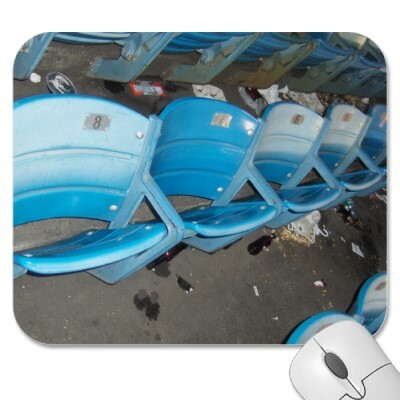 It was regarding the last game played at Old Yankee Stadium in 1973 and really sums up what happened after the game and what happened to many of the seats and artifacts from the Stadium.